Being a child of the eighties, Whitney Houston was a soundtrack to my early years. I have fond memories of singing along to Whitney tracks with my parents and siblings. Even nowadays when I need to get on with the cleaning, I whack her Greatest Hits on and power through my jobs. 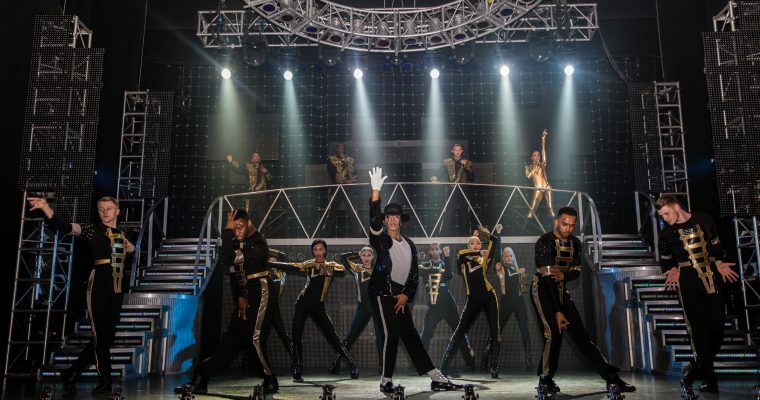 When I heard that The Bodyguard was coming to Bristol Hippodrome, I knew I had to see it. 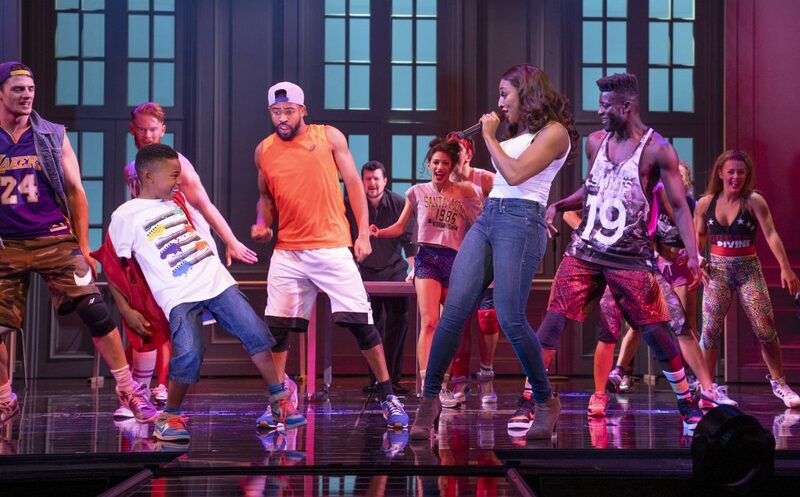 The Bodyguard on stage is an adaption of the 90’s film that starred Kevin Costner and Whitney Houston herself. 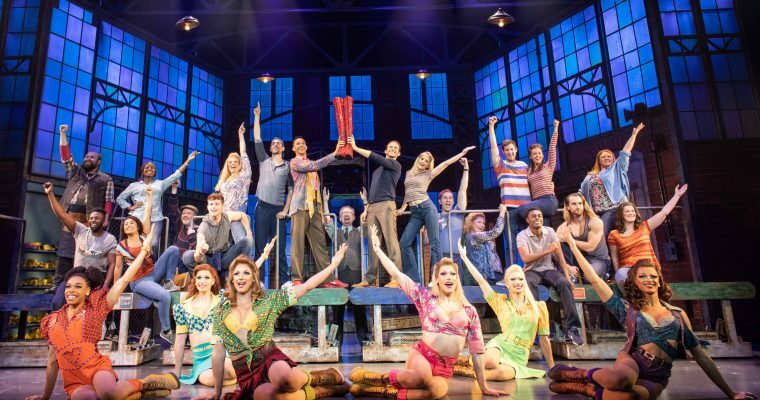 The touring cast is headed up by Alexandra Burke playing Rachel Marron and Benoît Maréchal playing Frank Farmer. 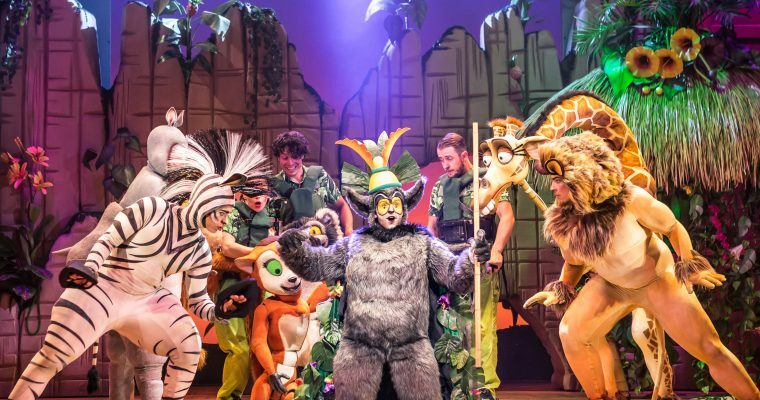 The supporting cast were enthusiastic and animated throughout the whole production. 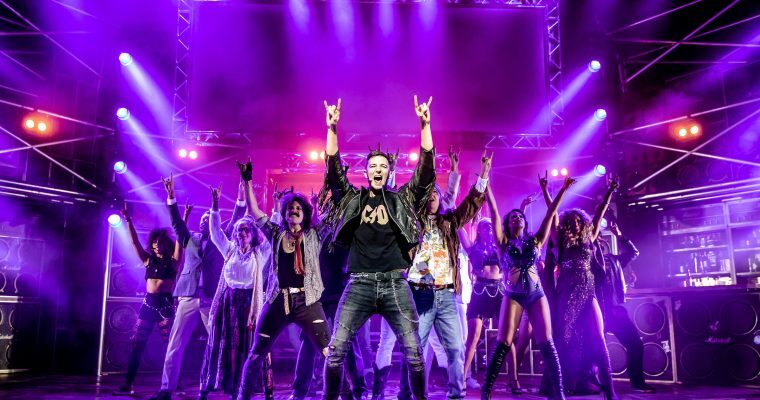 The production started in a thrilling and high energy way. Before my eyes, the stage came alive with the energetic male dancers, plus the explosive pyrotechnics. So my attention was very firmly on the stage, a real treat for any Mum’s on a Wednesday night! I have watched the film a couple of times and seen The Bodyguard in the West End some years ago. The whole production followed the film very closely. There were some updates to the show. 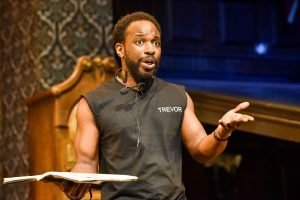 For example, the cast began to talk about a picture that went viral on Instagram and Frank Farmer’s character was checking emails on his phone. Which wouldn’t have happened in the 90’s. Young Fletcher brought the cute factor to the show, his break dancing and singing had the audience smiling along. Even though I knew the story, some moments still continue to have me on the edge of my seat. Especially the moment when the Nickie Marron (played fantastically by Micha Richardson) was murdered. 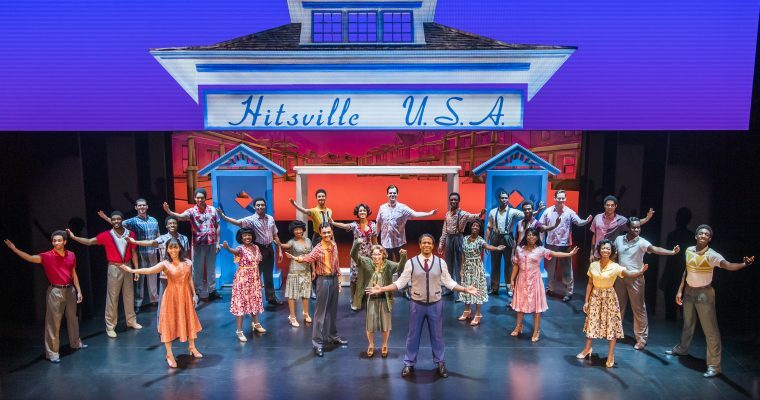 Once the production had come to an end the audience were invited to get up on their feet to dance and sing along to the pure Whitney classic, Dance with Somebody. 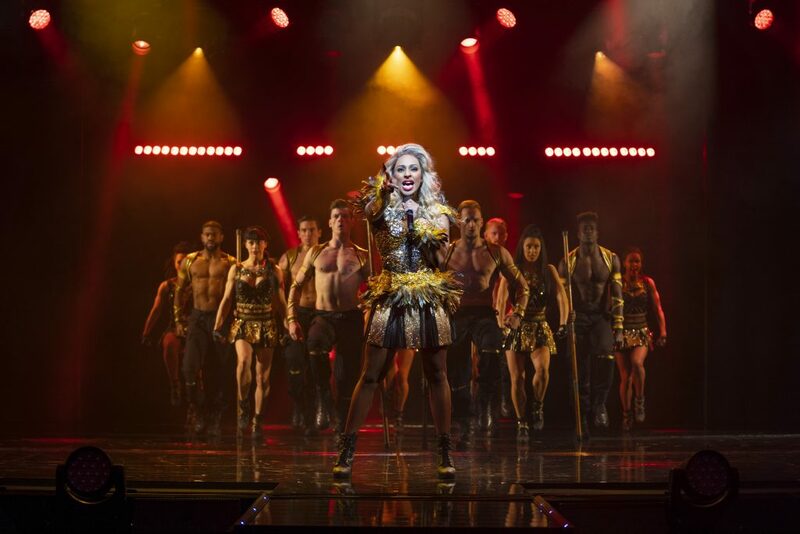 The Bodyguard is exciting and entertaining from start to finish. Disclaimer – We received 2 press tickets in return of an honest review. 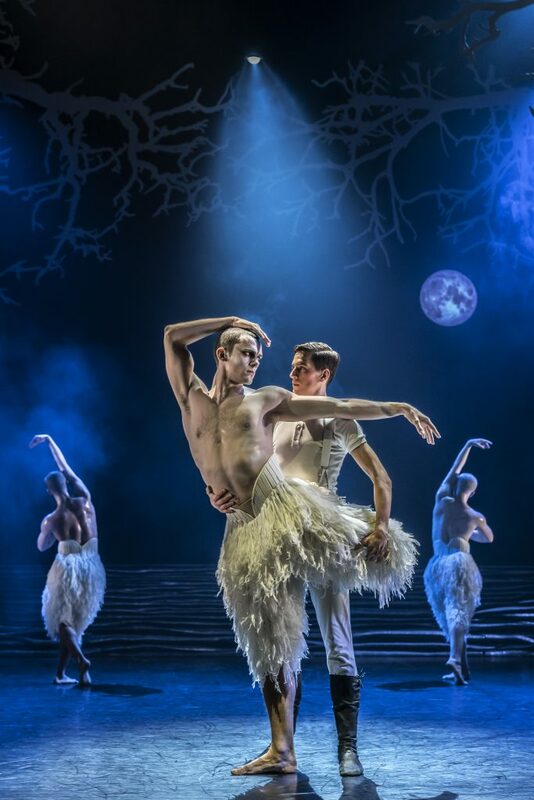 This week Bristol Hippodrome hosts Matthew Bourne’s Swan Lake. I was lucky enough to go along to my first ever ballet on Tuesday. I wasn’t sure what you expect as it was all new to me. My friend that I watched with had last seen Swan Lake many years ago. The New Adventures production of Matthew Bourne’s Swan Lake is currently in the middle of a 32 week tour. It will continue until May 2019 and during it’s run it will visit 22 locations. Matthew Bourne reinvented the traditional Swan Lake Ballet for the first time back in 1995. At the time he only had a very small company with only 6 dancers at the time. So he had an enormous challenge ahead of him, but with some great cast members including Adam Cooper. Cooper worked with The Royal Ballet but was a fan of Bourne’s work and wanted to work with him. Then with the choice of Lez Brotherston as designer and David Lloyd-Jones as the conductor, they had a groundbreaking and successful team. The ballet opened at Sadler’s Well in November 1995 and over 23 years later it is still extremely popular. I love the escapism of watching a production at the theatre, phone off and brain only engaged on the show I’m watching. And from the opening Act of Swan Lake I was captivated and wanting more. There were moments of wit as well as some serious tension. The swan – Will Bozier – was captivating and fascinating to watch. 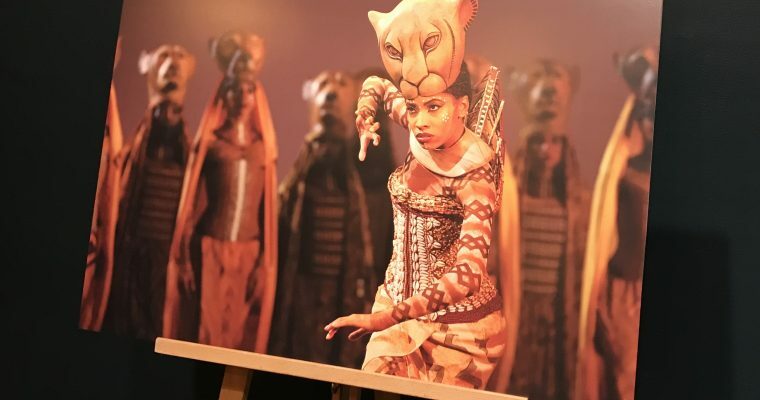 The Queen – Nicole Kabera – was cool but mesmerizing. The iconic swan costumes were simple but flamboyant at the same time. I loved the whole production, if you have never been to the ballet you should. Disclaimer – I received 2 press tickets in return of an honest review, all words are my own. If you have children aged 7 upwards you will probably have heard of the Tom Gates books. My 3 middle children 7, 9 and 12 have read them all. Liz Pichon’s clever stories and doodles can engage even the most reluctant readers. Once the invited to Tom Gates Live popped into my inbox, I knew Jolie, 9 would be so excited. 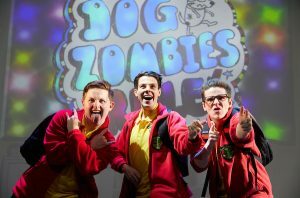 The show was produced by the same team that brought Gangsta Granny and Horrible Histories to the stage. 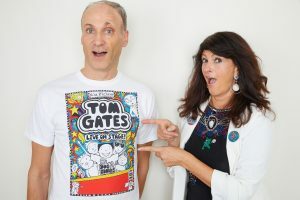 Liz Pichon and Neal Foster adapted the books to bring Tom Gates alive on the stage. 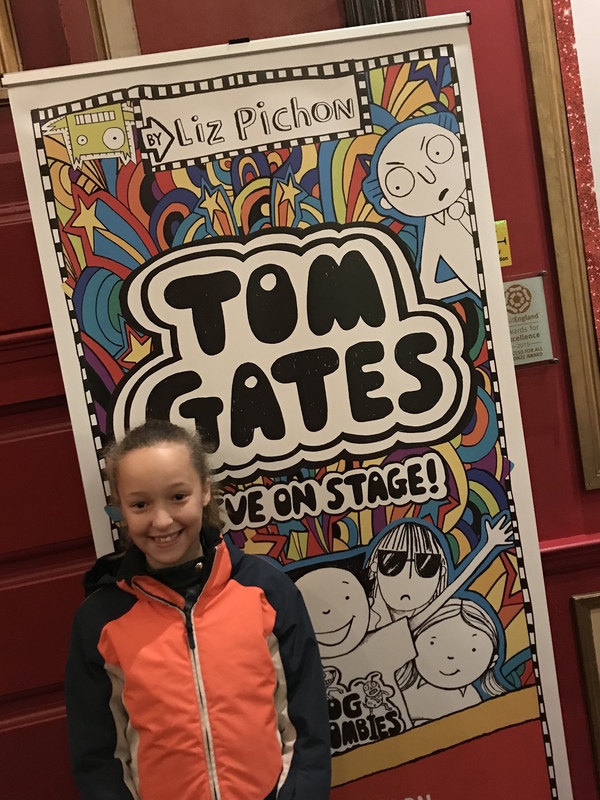 Tom Gates Live was on at the Bristol Hippodrome during February half term. From the start, the jokes started rolling and Jolie was giggling. It seems, however, Tom tries he still manages to get into trouble at school and it is a constant battle not to get too many sad faces. The set was quirky and interesting. Anyone that has read the Tom Gates books will know of the Dog Zombie songs which are a big feature. So we were expecting to hear a silly tune or two. ‘We want chips’ had the younger members of the audience singing along. The show included the run up to ‘The Fossils’ wedding, there are a series of mishaps. But will Tom manage to save the day and make sure the wedding goes to plan? Matthew Chase played Tom Gates who has a massive portfolio of theatre work including being Ryder in Paw Patrol’s arena tour. Also a familar face to me was Justin Davies, straightaway I recognised him from Sky one’s Stella. In which he played Ben Morris. 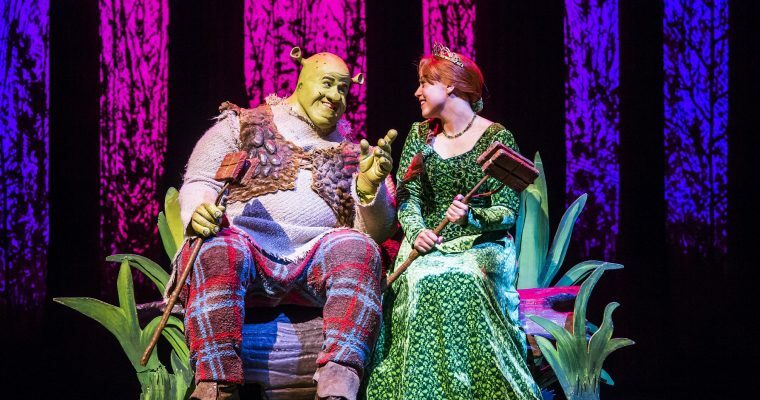 Disclaimer : Bristol Hippodrome offered us 2 press tickets in return for a review, all words are my own. 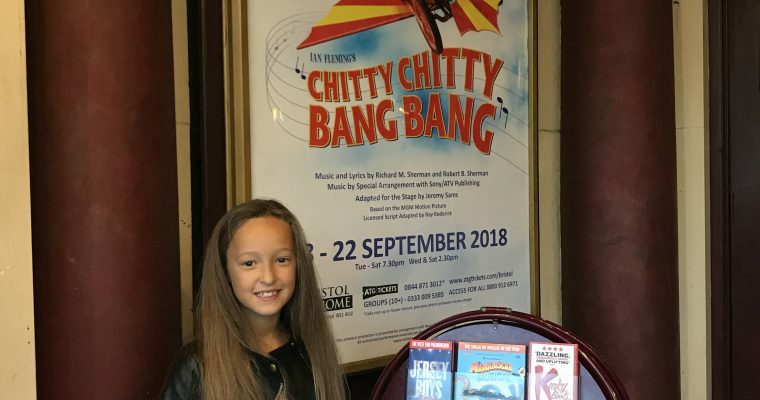 Nothing spells out Christmas like a P A N T O M I N E and this week Lexia and I were lucky enough to head to see Cinderella at Bristol Hippodrome. 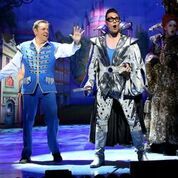 This year’s panto has stars Gok Wan and Brian Conley plus a full cast of great actors. Including the young talents of performers from the Bristol School of Dancing. From the minute Fairy Gokmother burst onto the stage the jokes stated to roll. Gok Wan, brought lots of humour to his role, including lots of references to his How to Look Good Naked show. Gok’s costume was shiny and sparkly and perfectly too flamboyant. 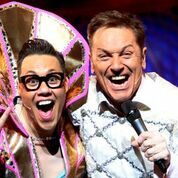 Brian Conley played buttons, who brought humour and many references to the trends of 2018. His floss was quality viewing and had the audience smiling. The singing and dancing from Cinderella played by Lauren Hall was magnificent. 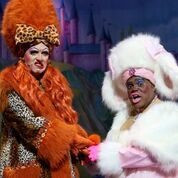 Ben Stock and Neal Wright aka The Ugly Sisters were comical throughout. Therefore their references to being ‘identical’ plus looking amazing brought plenty of giggles to the audience! The fairy Gokmother admits it would be a challenge too far to get them to look good! The set was grand and eye-catching, especially the Ballroom so when Cinderella and Prince Charming finally came together to live happily ever after, their entrance was like a real-life fairytale to the younger children in the audience, definitely something that they will remember for a long time. The show was definitely for all the family with the magic of Cinderella. started some risky adult humour thrown in. No panto would be complete without a bit of audience participation. Buttons got a member of the audience to help his efforts to win ‘Bristol’s Got Talent’. Some children from the audience helped out with a singalong with Buttons so tha was entertaining. The team at QDOS Productions did a fantastic job and Cinderella at Bristol Hippodrome is definitely one for the memory jar. 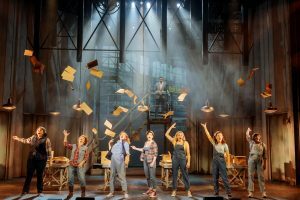 The production runs until 6th January 2019 and tickets can be booked online at atg tickets. Disclaimer : Bristol Hippodrome gave us 2 press tickets for Cinderella the Pantomine in return for an honest review. All words and views are my own. 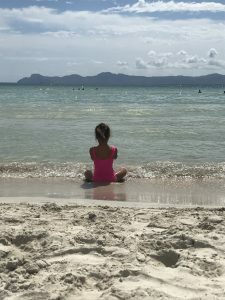 If you regularly read our blog you will know the kids and I went to Alcudia, Majorca with Melon Holidays. So following our post before the trip, its time to review it. By the time we headed to the airport, the kids were super excited about our adventure. 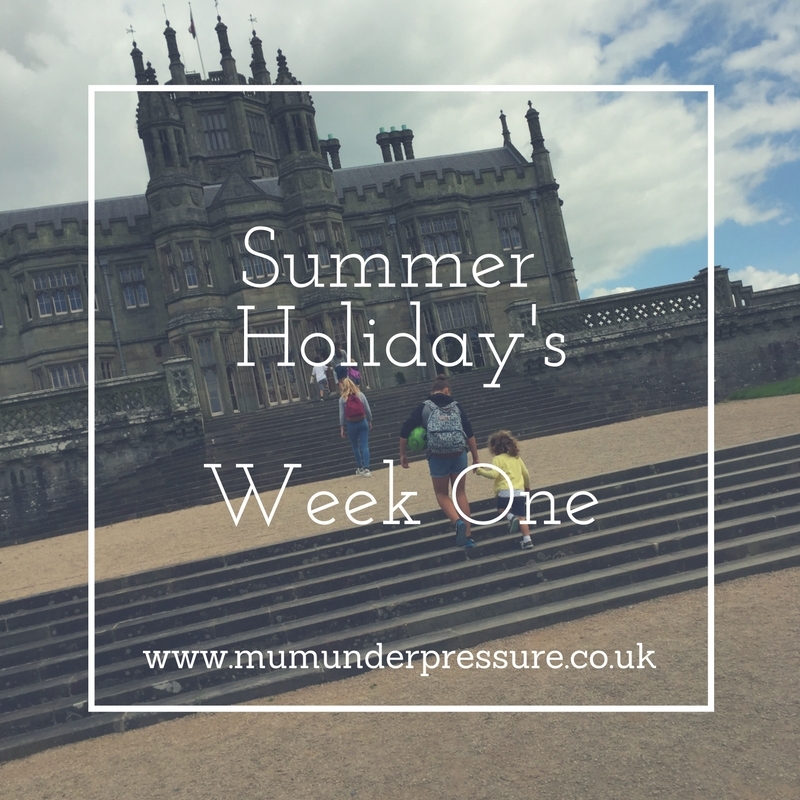 I was still feeling slightly apprehensive about the flight with four of the kids on my own. They were so well behaved and the flight activities bags I had packed for them worked a treat. After the early start, spending time in the airport, the flight and baggage claim. I was flagging, so when we came through arrivals it was so lovely to be welcomed by our Melon holiday host, Melissa. She instantly offered to help with luggage, which was very welcome. Then she arranged which coach we need to get on to the hotel. We hopped on the coach and headed to the resort. Melissa added us to a WhatsApp group with all of the other single parents that were joining us on the holiday. This was great to keep us in touch over the week. She had also arranged for all of the families on the trip to have dinner together on the first night. I was looking forward to and also a little bit nervous about meeting the other families. We had all arrived on different flights, so hadn’t met before dinner. As soon as we met we gelled, something in common straight away. Sitting at dinner as the only adult with kids can seem like constant I’m forever saying ‘don’t do that’, with very little conversation. But having dinner with other adults means that I could chat and cut the kids some slack on the don’t do that’s!! We joined each other for dinner every night during our holiday. When I got home I missed the dinner adult conversation and the wine too! That evening even though we were all pretty tired from travelling, we watched the hotel entertainment and had a late night. So by the next morning, the lack of sleep had caught up with the kids and I. We slept in through breakfast, oops! That morning Melon holidays did a welcome meeting that was very informative about Alcudia and other towns/attractions further afield. For the rest of the day, we chilled at ‘our’ pool. Our apartment overlooked a pool, so it became ‘our’ pool! We then got ready to meet the other families for dinner. Tuesday was the trip day, melon holidays arranged and included a trip. 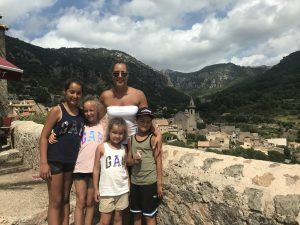 We travelled across the island to Soller and then onto Valldemossa. During the trip, the guide shared loads of interesting facts about the island. The kids were amazed that Majorca only has 900,000 inhabitants but welcomes around 14,000,000 tourists every year. 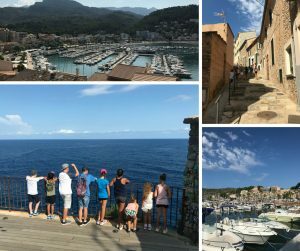 Our outing started at the Port of Soller, very picturesque. We walked up the hill to take in the view of the harbour and then on the other side the cliffs. Definitely a photo opportunity. We then took the wooden tram into the town of Soller. The quaint streets were very beautiful and gave the kids an idea of old-time Majorca. Some of the families wanted to visit museums and others like us wanted to get some lunch. Melissa is fluent in Spanish, so she was really helpful when ordering lunch. After lunch, we met the trip guide and walked back to the coach. Once on the coach, we headed to Valldemossa along the mountain roads. The kids loved taking in the cliff top views, me not so much. The roads were very windy, however, the journey was very much worth it. Valldemossa is beautiful, the highest town in Majorca, the views are lovely. The kids also tried to do a bit of celebrity spotting as there are some very exclusive hotels and homes nearby. Through the week we met with the other families often. 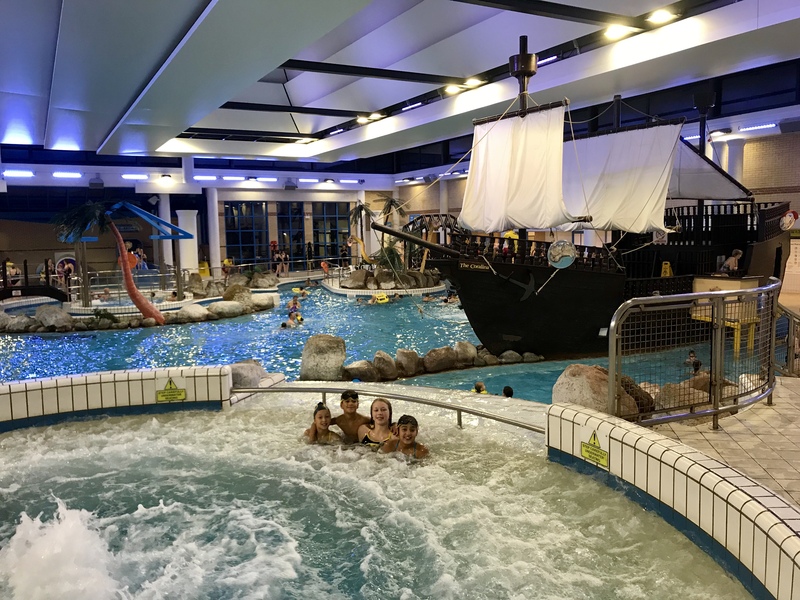 The kids all got on really well and spend a large proportion of their days playing in the pools. One evening we took a moonlight walk along the beach after dinner, something I wouldn’t have done alone, not knowing the area. So this was a massive benefit of holidaying with Melon holidays. 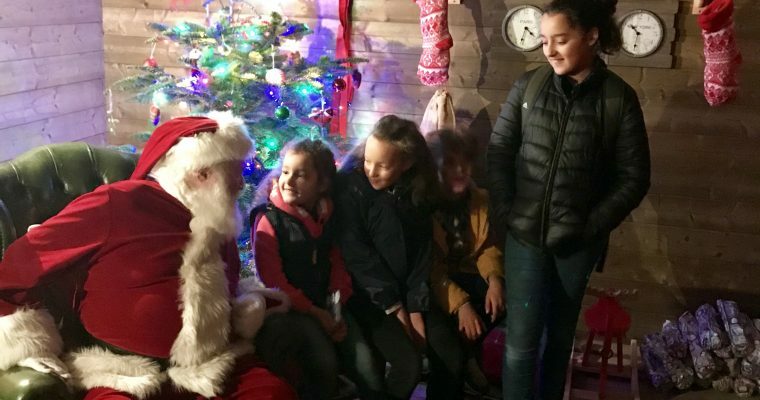 But I never felt that I had to go along with the crowd, if the kids and I didn’t fancy something the others were doing, we just dipped out no hard feelings. My life is very hectic, with work and a big family, so I wanted to relax. So most of the week was slow starts in the morning, time at the pool, the odd trip to the beach. 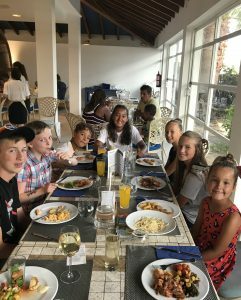 One of the other families had caught the public bus to Old Town Majorca, she filled us in one evening at dinner. 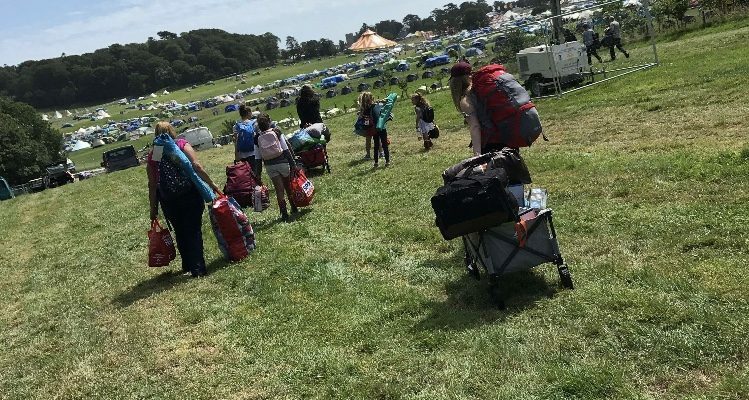 The kids decided that wanted to do the same the following day, I felt confident taking them as I knew exactly where to get on etc. The walled old town was impressive, however, the kids were pretty hot, it was 30 degrees plus the morning we visited, so only stayed about an hour and a half. We knew the buses were very regular back to our part of the resort. It wasn’t long and the kids were back cooling off in the pool. SeaClub Mediterranean Resort has 8 pools across their 2 story complex. I loved the feel of the resort, very chilled and friendly. At the hotel there were kids clubs if the children wanted to go. Aliza went one afternoon but the others were more interested in the pool, do you see a theme here! The kids club building, ‘Magic Garden’, had a softplay climbing frame/ballpit. Lots of toys, a snug showing films plus tables with colouring and craft activities. Our holiday was half board, breakfast was a buffet. We had lots of choice from a full cooked breakfast, pancakes, pastries, fresh fruit and cereals. 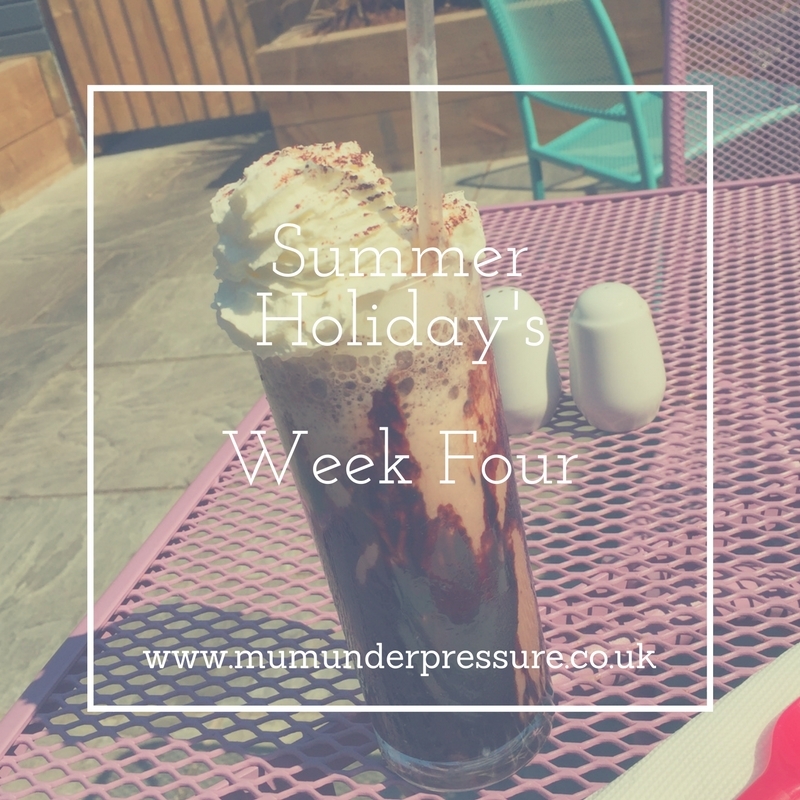 And not forgetting the gallons of milkshake my kids need to fuel them for their day. We were able to get our breakfast in the Seabreeze restaurant a few paces away from our apartment. At dinner we had to head over the main restaurant. The staff were very friendly and reserved us and the other families we were holidaying with a table every night. The restaurant provided a wide range of food, which changed every night. The kids mostly headed to the kids counter, which had simple things like chicken nuggets, breaded fish and pizza. There was tapas, a huge selection of mains and then lots of choice of deserts. The kids especially like the chocolate fountain. 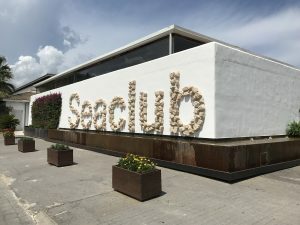 SeaClub was a 10-minute walk from the beach. Then about a 30-minute walk along the beach into the bustling port. We were able to hire beach/pool towels from SeaClub which was great if your packing light. There was entertainment every night and the animation team also did many sports/pool side activities throughout the week. Our melon holiday was amazing and will definitely live in our memories for a long time. The support and local knowledge of our holiday host Melissa was outstanding and highly recommended. The kids and I spent the week with a great group of new friends, just the break we needed. 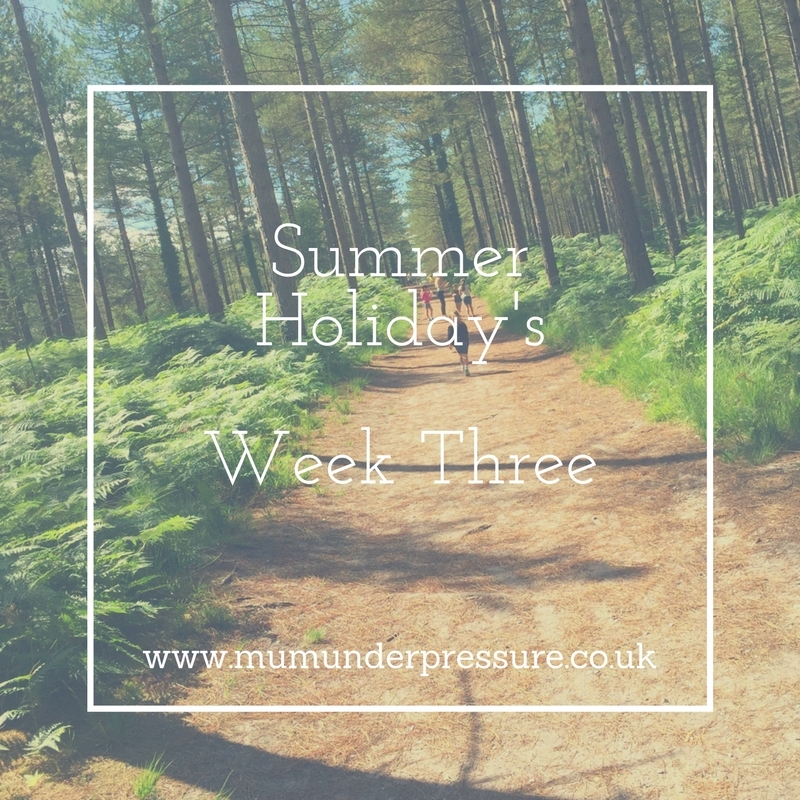 We will definitely be looking into holidaying again with Melon Holidays. 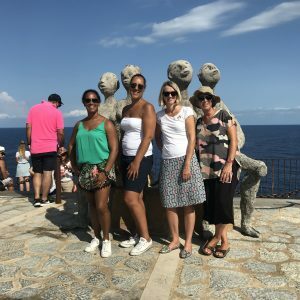 Melon Holidays have lots of other great holidays coming up including trips to Crete and Canaries in October. 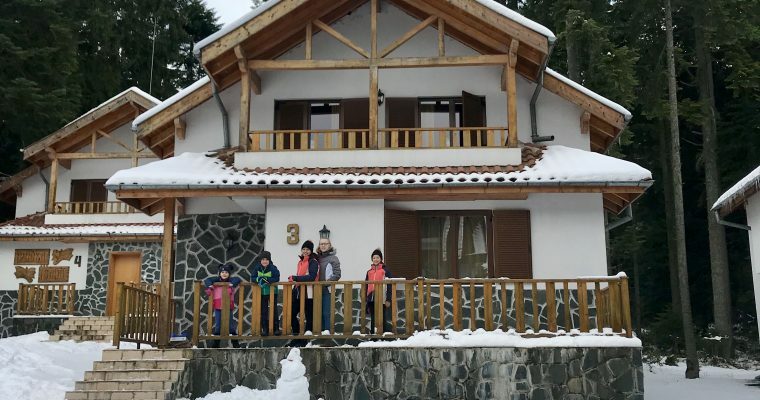 Plus an exciting New Year Skiing Trip to Morzine. And they have some new UK desintaions coming soon too. Disclaimer: We were offered a holiday to review in return for an honest review. All words and pictures are my own. An Officer and a Gentleman is currently on stage at Bristol Hippodrome. Last night I went to watch it, being an 80’s baby I never knew all the hype around the film. However, when I have spoken to people about it they have raved about Richard Gere’s performance. So I was hoping that the theatre production would also deliver an entertaining show, I wasn’t disappointed. When I arrived and looked through the musical’s program I instantly recognised many of the songs. Well, who hasn’t sung Living on a Prayer at full voice sometime in their life? 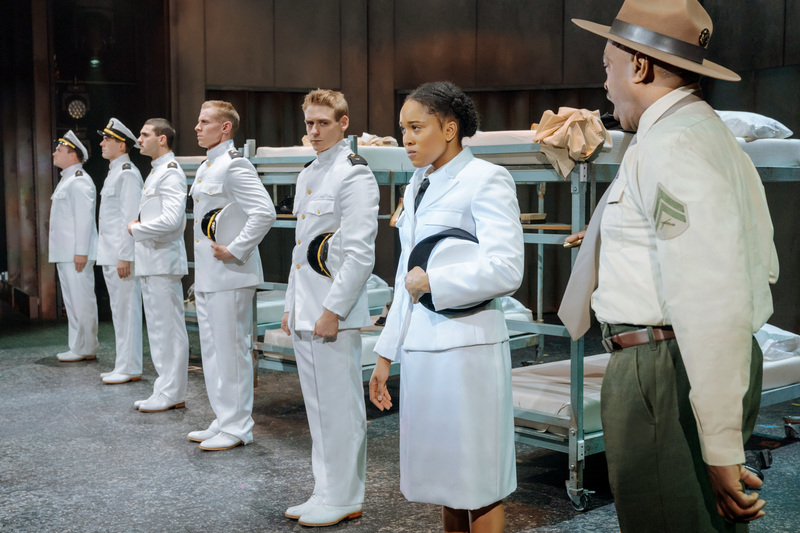 An Officer and a Gentleman Musical tells the story of Zack Mayo during his training to become the best, A US Navy Pilot. Zack arrives on his motorbike with a lot of attitude. But over time Sergeant Foley whips him into shape. During his journey through the rigorous 12-week training, he meets local girl Paula Pokrifki when he is on a liberty weekend off. Paula works in the Pensacola Paper Factory but has aspirations to live out her dream and become a nurse. She often tells Zack to believe in himself and he will succeed. Zack played by Jonny Fines and Paula played by Emma Williams entertained the audience with seamless renditions of so classic 80’s tunes. The 12-week training course was too tough for some, they DOR’ed and rang the bell, quitting the course. Even though Zack came close to quitting he knew he had more to prove. Also, the rivalry with his co-candidate Casey Seegar (Ghetto Girl) turned to friendship through the weeks and Mayo helped her to complete the final athletic course. The course took a victim, Zack’s buddy Sid, his death spurred Zack on to realise the importance of love and friendship. So soon after Zack completed his training he declared his love for Paula. The comradery between Foley and Zack ‘Mayo’ became stronger towards the end and it was lovely when Foley issued Mayo with his wings. Also making his and Seegar’s dreams come true by announcing they would be learning to fly Jets. 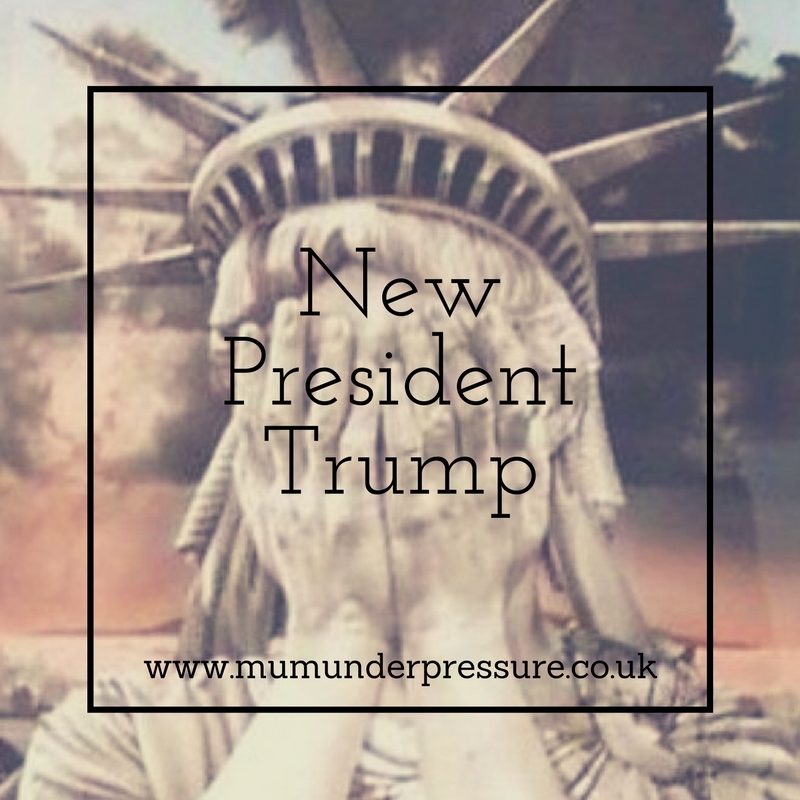 Disclaimer: I was offered press tickets in return for an honest review, all words and views are my own. 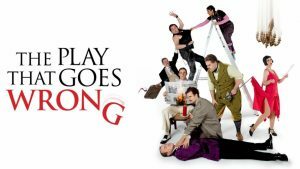 This week Bristol Hippodrome welcome The Play that Goes Wrong. It is a hilarious light-hearted comedy. The Play That Goes Wrong has been a huge hit in the West End since it’s launch in 2013. It has also been played worldwide on every continent except Antarctica. The Play that Goes Wrong is also the proud owner of some amazing awards including 2015 Olivier Award Winner for Best New Comedy, 2015 BroadwayWorld UK Winner for Best New Play and 2014 WhatsOnStage Award Winner for Best New Comedy. The show started before the curtain even rose. With the backstage crew, especially Trevor, getting the audience involved looking for the lost dog. Then getting an audience member up to help prop up the mantlepiece. Straight away this broke the ice and made me realise I was in for a comical evening. The play was a play within a play. ‘Cornley Polytechnic Drama Society’ is the fictional am dram group that act out the play. Once the play started the ‘Director’ played by Jake Curran explained about past disastrous productions from the drama society. Trying to assure the audience everything will be fine if nothing goes wrong, well as the title suggests everything did go wrong. Murder at Haversham Manor was a live who done it style play. Charles Haversham is murdered just before his engagement party. But not as seamless as your average play, ever thinkable mishap occurred. 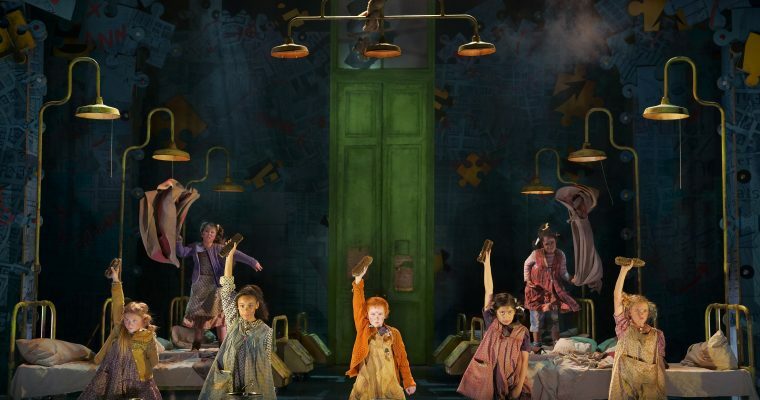 With a clever set design that enabled it doors to stick shut, paintings to fall off of the walls, all the things that made the audience roar with laughter. The actor’s passion, had the audience hooked from the start to finish. Throughout the 2 hour play, I laughed out loud at the slapstick humour. The play was given an 8+ advisory, my 12 year old would have loved it. 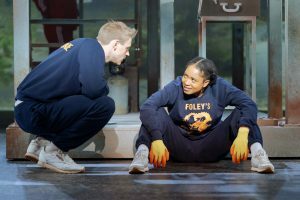 The Play That Goes Wrong is a feel-good production and it is completely understandable why it is so highly regarded in the theatrical world. 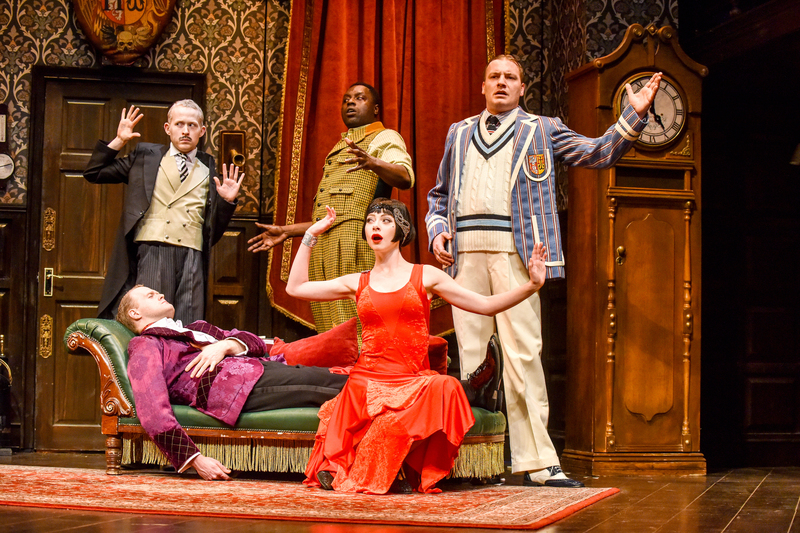 The Play That Goes Wrong is at Bristol Hippodrome until 21st July and then it will continue its tour. Disclaimer: I was given press tickets in return for an honest review, all words are my own. 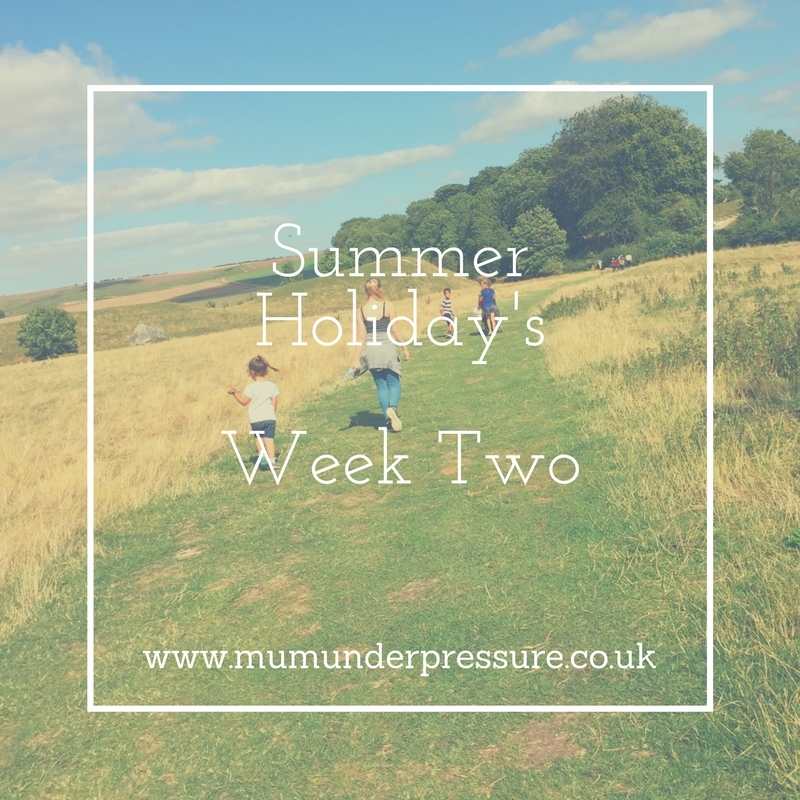 Being a busy Mum nights off are rare, but last week I went out! 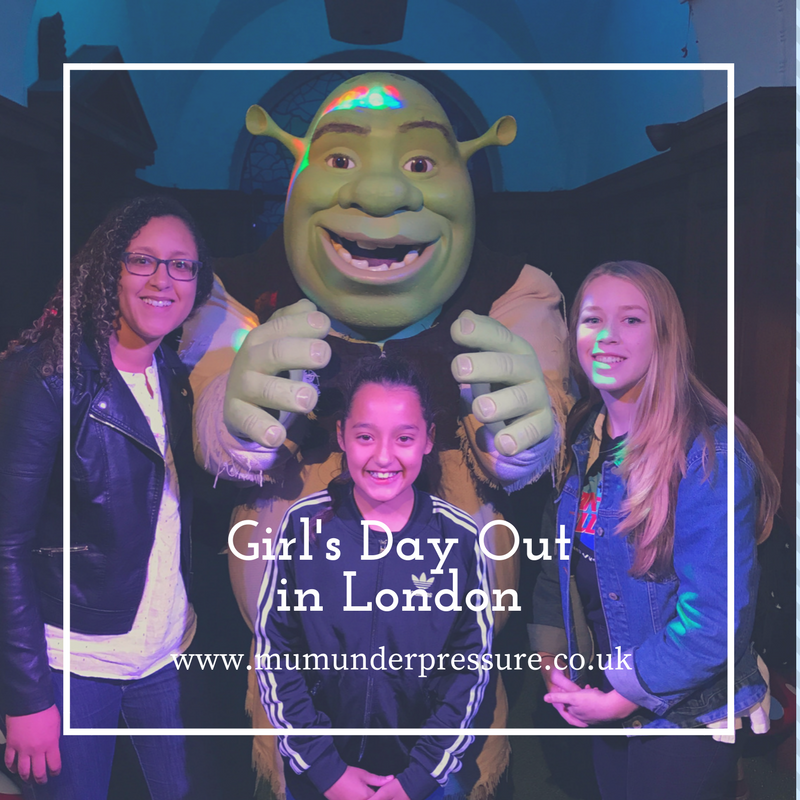 A trip to the theatre to see Miss Saigon was our destination. 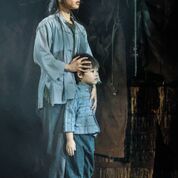 Miss Saigon opened at Bristol Hippodrome on 23rd may and will be running for a month until 23rd June. As much as I loved the production, at points, it was hard to watch. Seeing how the young Vietnamese women with treated and exploited. Whilst they were just desperate to find freedom in the west. The story portrays the basic human instinct just to survive in the nightmare time. Kim played by Sooha Kim so very well, making you feel like you just wanted to hug this frightened young girl, who was caught up in the horror of the war. As the production played out, she grew from the girl that fell head over heels in love with Chris. To a strong mother that would do anything to protect her son and give him the best possible future. She shunned the proposal of marriage from Thuy to wait to find the love of her life Chris and reunite him with the child he didn’t know existed. Chris played by Ashley Gilmour, was incredible and gave the views an understanding of the darkness the situation left the veterans in. His heartbreak for leaving his love, Kim and the difficulty of moving on with his life. The nightmares left behind would never leave him, but finding love with Ellen made a brighter future possible. Until he had news that Kim was still alive and also had his son. He was torn between his love for two women. Even though the production was very serious, the extremely humorous engineer played by Red Concepcion brought light to the situation. His singing, dancing and all around smile breaking made me want to see him make it to America and find his riches. Being a child of the 80s I don’t think I understood the sheer enormity of the effect of The Vietnam War. My parents obviously sheltered me from it. So it was gripping to see Cameron Mackintosh’s portrayal of it through this play. 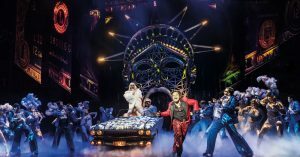 Miss Saigon originally opened in 1989 in Drury Lane at the time The Vietnam War had only been over 14 years, so the effects were still pretty fresh in peoples minds. Miss Saigon is an adaption of the 1903 opera Madame Butterfly. Madame Butterfly and Miss Saigon have many similarities, including the clashes and misunderstanding of each other’s cultures. Including the way that they both have a wedding and these are discounted by the western men. Stories of rejected children and heartbreakingly the mothers die at the end. 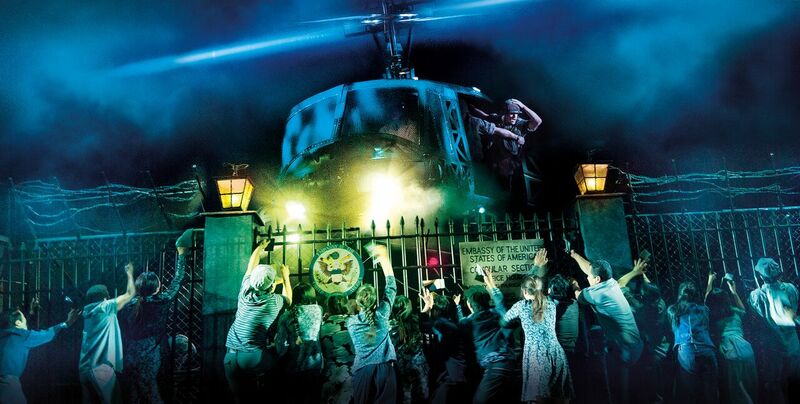 Miss Saigon was an adrenalin filled, highly emotional unmissable story. 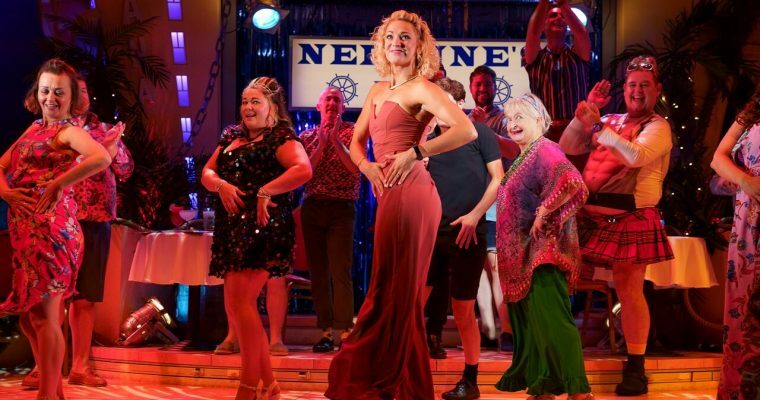 It runs at Bristol Hippodrome until 23rd June and then will continue to tour the UK. Disclaimer : I was offered press tickets in return for an honest review, all words are my own. 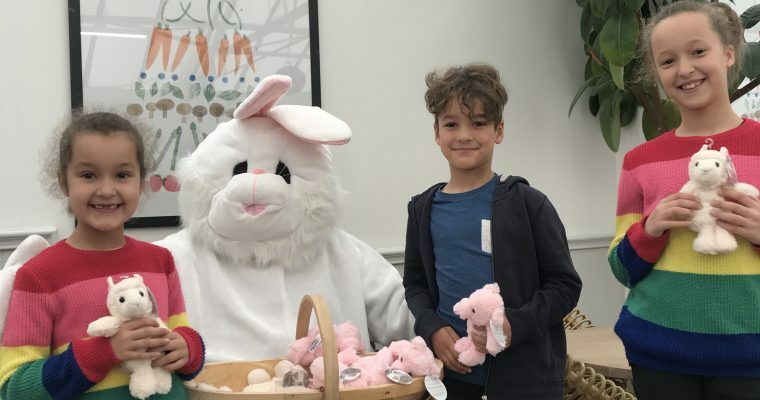 Recently the kids checked out the Mardles – The Egg Who Couldn’t Wait book and Mardles Cutie Stickers. Mardles bring characters to life with their augmented app. The app is quick and easy to download on Apple Store, Google Play and Amazon Apps. 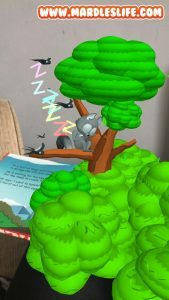 Once you have downloaded the free app, you point your phone or tablet at the wand on the book and it brings the book to life. Then children can control the Mardles characters with the onscreen joystick. The Mardles characters have very realistic sounds and movements, which kept the kids engaged. The kids enjoyed taking pictures with the mardles in. 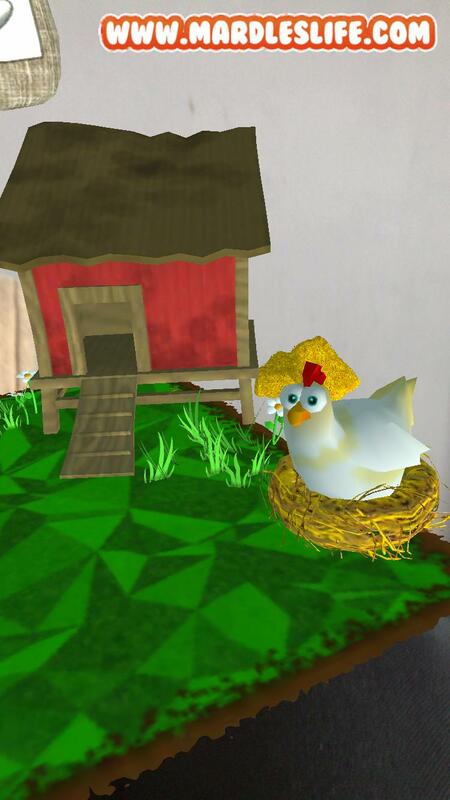 Especially taking selfies with the chicken! 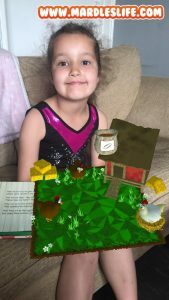 Our household loves books and technology, so mardles was a real hit. They could read a bit and then pay with the book characters on the app. Mardles also have a great range of stickers, that can mean it is easy to take the fun with you where you adventure. As once that the app is downloaded you don’t need internet connections to use it. We tried out the cutie pack, which the girls loved as they are unicorn crazy. So they loved seeing unicorns jumping around the house. The stickers are a great treat for little one, that keeps giving, the stickers are reusable. We had lots of laughs trying out the book and stickers with the app. Definitely, one to brighten up a rainy afternoon. Disclaimer: We received a Mardles book and stickers in return for an honest review, all words and pictures are my own. 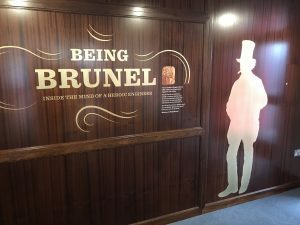 On 23rd March the brand new museum ‘Being Brunel’ opened at SS Great Britain. The museum has the harbour on one side and the impressive SS Great Britain ship on the other. As a family, we love to visit new and exciting places. 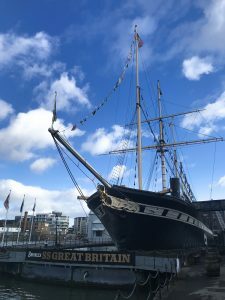 Until a few months ago I had never been to SS Great Britain myself, but my 6-year-old’s topic for the last term was Isambard Kingdom Brunel. So every day he would return home with more facts about the Engineer himself, plus the iconic Boats, Tunnels, Railways and Bridges. 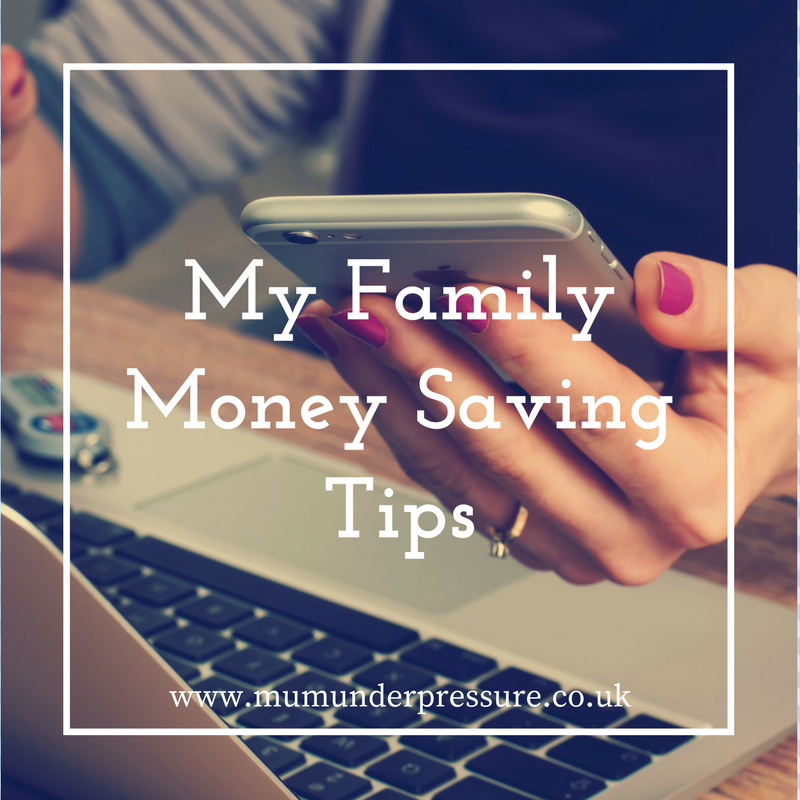 Which got the whole family talking and interested in finding out more. I joined his school trip to the SS Great Britain and was wowed by it straight away. 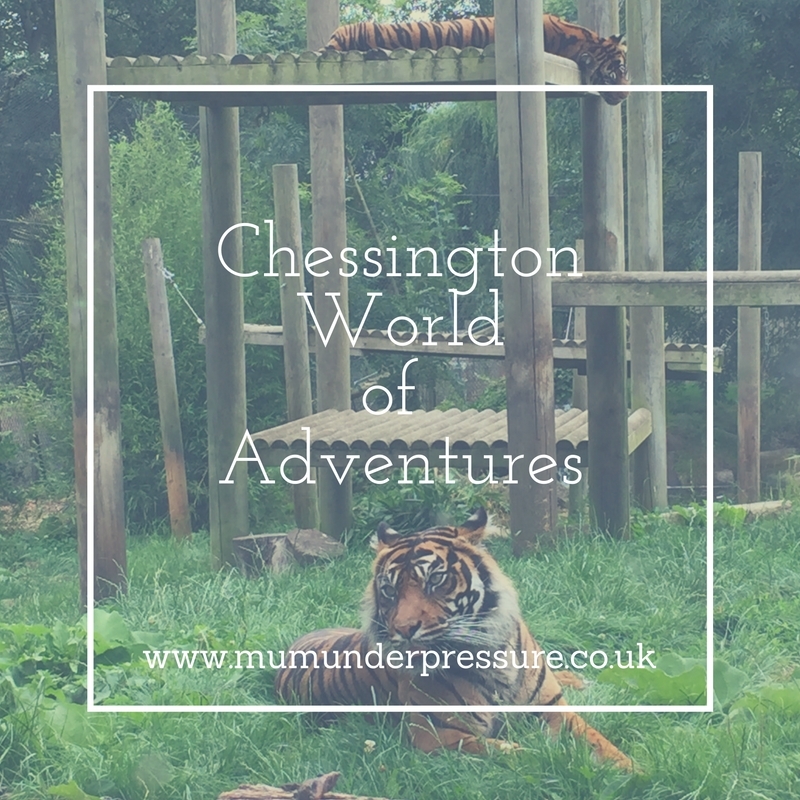 So much to explore to keep Little Nippers entertained. But my 8-year-old was mighty jealous of the visit as she loves all things history. So when we got an invitation to the opening of Being Brunel, by Bristol Bloggers, we were excited to be going along. 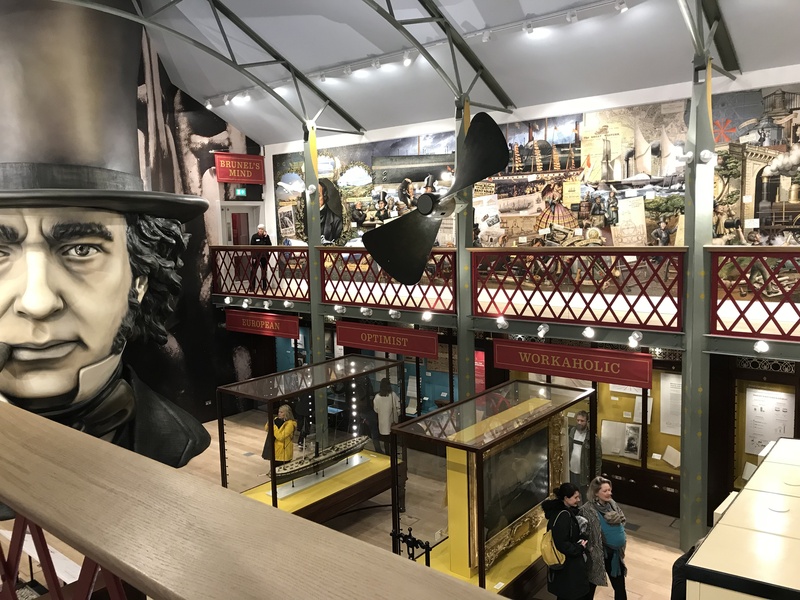 The new visitor attraction consists of six galleries housing around 150 personal artefacts of Brunel. 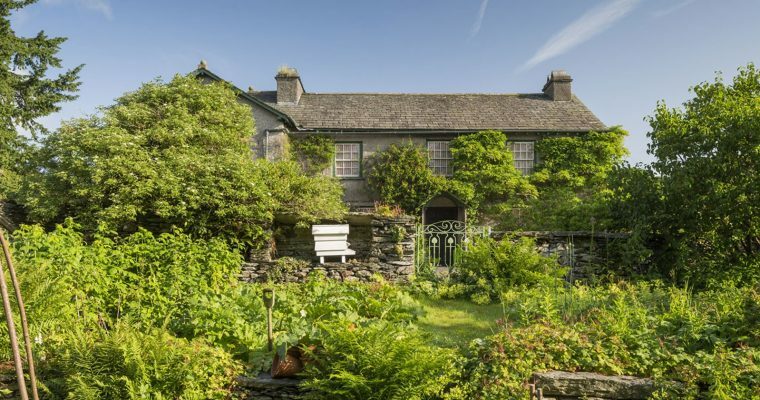 The project cost £7.2 million to bring to life, which included over 5 million from The National Lottery Fund. 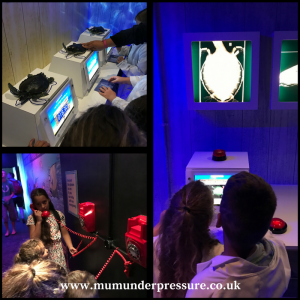 The museum is interactive and for children of all ages. 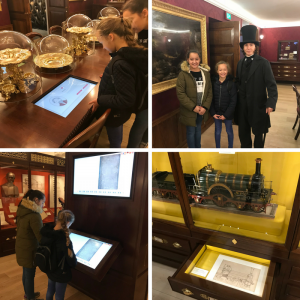 With drawers to open and a rickety train carriage stimulator on which you can try to draw a perfect circle, as Brunel did, plus top hats of all sizes to try on and screens with tasks to carry out. When you first walk into the main exhibition area you are wowed by a huge mobile of I K Brunel’s face. As you head up the stairs to the top of the gallery there is a timeline of his works, then you can overlook the main exhibition space. 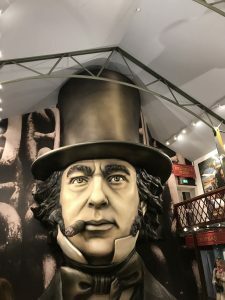 We then headed through to Brunel’s Mind, I enjoyed it but have to say it isn’t really suitable for younger children, as my 8-year-old jumped a few times. So would take a miss on this when I visit with my younger children. 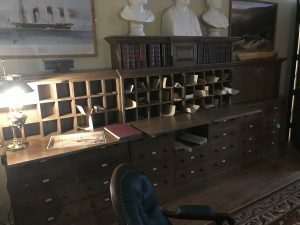 Once we had been through Brunel’s Mind it was into his London office, check out these pigeonholes below slightly different from today’s email sent folder. Including his original office where he in fact designed and built the SS Great Britain. The attention to detail in there was great, with his iconic hat hanging on the coat hook, plus his dog curled up under his desk. The office was reconstructed based on a watercolour painted by his niece. 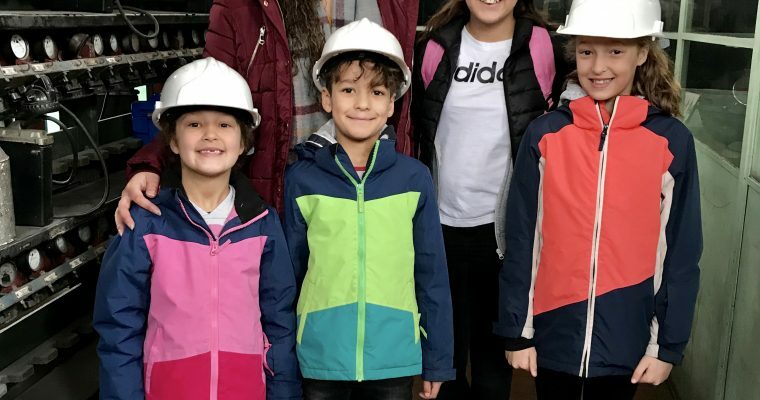 Once we had explored everything on offer in the Being Brunel Museum we then went down into the dry dock, and then on board the ship itself to see and smell all the different cabins and classes. We had a great morning and definitely could have stayed longer. We will definitely return, with tickets to SS Great Britain you can return unlimited times throughout the year. Adults £16.50, Children 5-16 £9.50 and Little Nippers under 4 are free, also they do Senior and Student concessions plus family tickets. 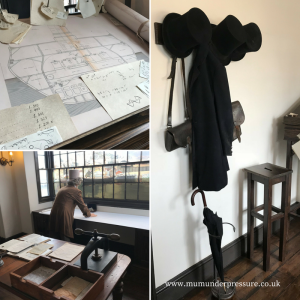 Disclaimer : We were given a free family ticket to SS Great Britain in return for an honest review of the Being Brunel Museum. All thoughts and pictures are my own. 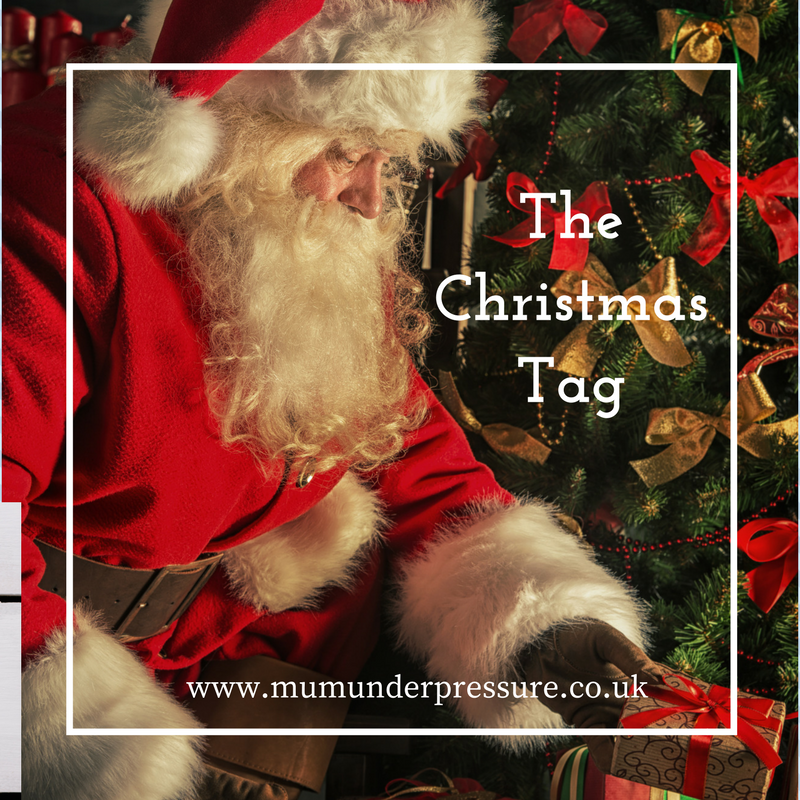 Hello and welcome to the Christmas tag! 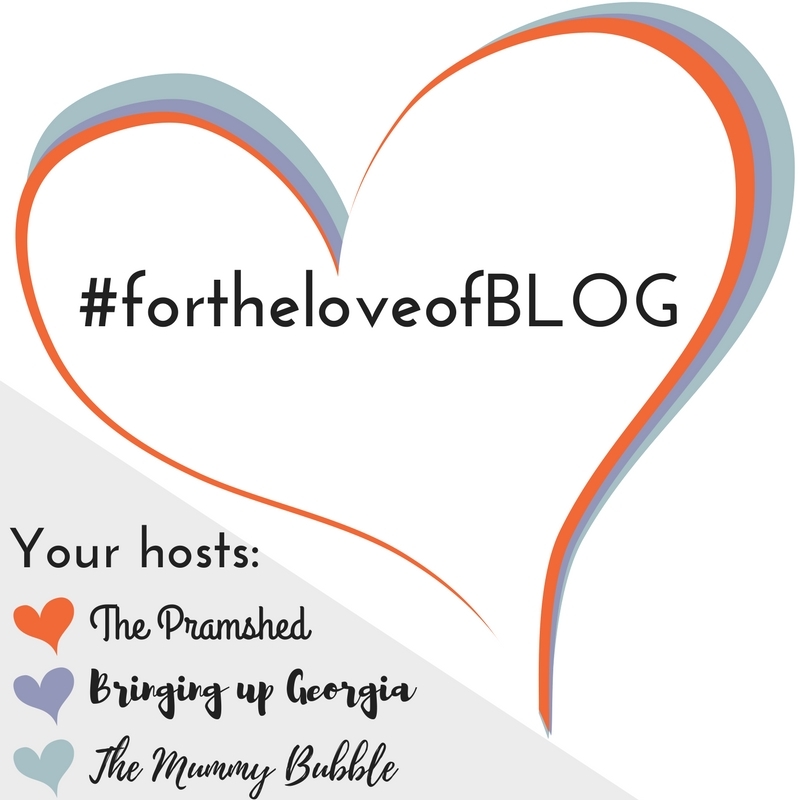 It’s a blog post chain linked by bloggers tagging each other to join in. 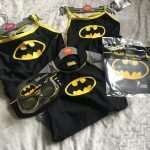 I was very kindly tagged by my fellow blogger – Thrifty Mumma Thrifty Bubba. You can read her own Christmas tag post by clicking here. I am not a film kind of person but the kids and I love a giggle at Natvity. Also, I have fond childhood memories of watching Home Alone. And dreaming of having a big family like there’s. I suppose that dream has come true but never managed to go on holiday without one of my kids, yet! I can’t remember snow on Christmas day. But in 2009 when J, was a baby, the days running up to Christmas were very snowy. Our family, both my sister’s families plus Grandma and Grandpa all shared Christmas in Devon. Our journeys from Hampshire, Wiltshire, South Wales and Cheshire being hard work to get through the snow. It was very icy around the lodges. I can remember a few family members doing a bit of dancing on ice! Even though I’m fully grown and have kids of my own. I always have spent Christmas with my parent’s bar 1 or 2. Now my Dad is no longer with us, we just bombard Grandma’s house to keep her company. I blinking love East 17 – Stay Another Day. Great for a bit of a car singalong. When we are in the festive mood though, you will find a huge selvction of Christmas classics on our Spotify playlist. Including Band Aid, Mariah Carey, Wham and Elton John. Ummm, I don’t think I can. There is Ruldolf obviously, ummm Prancer and Dancer??? Vixen, now to call the kids in for some help. Comet and Blitzen, any more kids, no! Ok looks like that is a definite no then. I am not that much of a traditionalist, as well I do get bored and like to keep things fresh. But the kids always put their stockings out on Christmas Eve. Plus leave the big man, a drink and mince pie! Also due to my sheer last minute buying, I tend to wrap most presents on Christmas Eve too. I had some great presents as a child. But have fond memories of our first ever family computer. It came in great big boxes and took hours to setup. We all thought it was amazing and sat around it mesmerised. When I was a child my Dad worked shifts in London. If he was rostered to work on Christmas Day, it was the best feeling in the world when he walked through the door after he finished work. Then we could open our presents. Also loved going to my Grandad’s for lunch and him picking up his dinner plate and drinking his gravy. 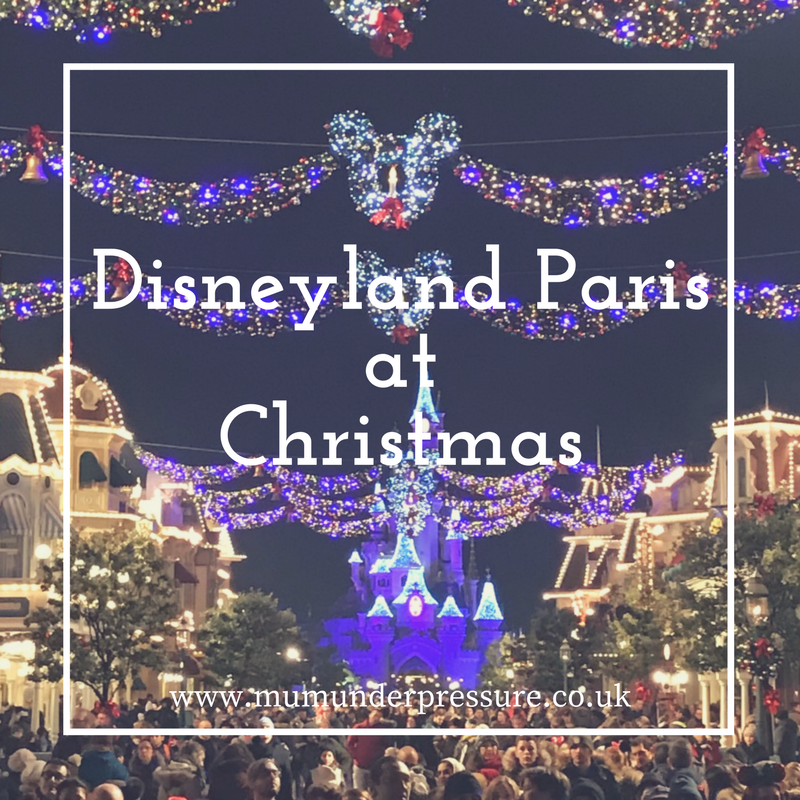 Last year we went to Disneyland Paris the week running up to Christmas. That has to be my most precious Christmas memory with all the kids to date. 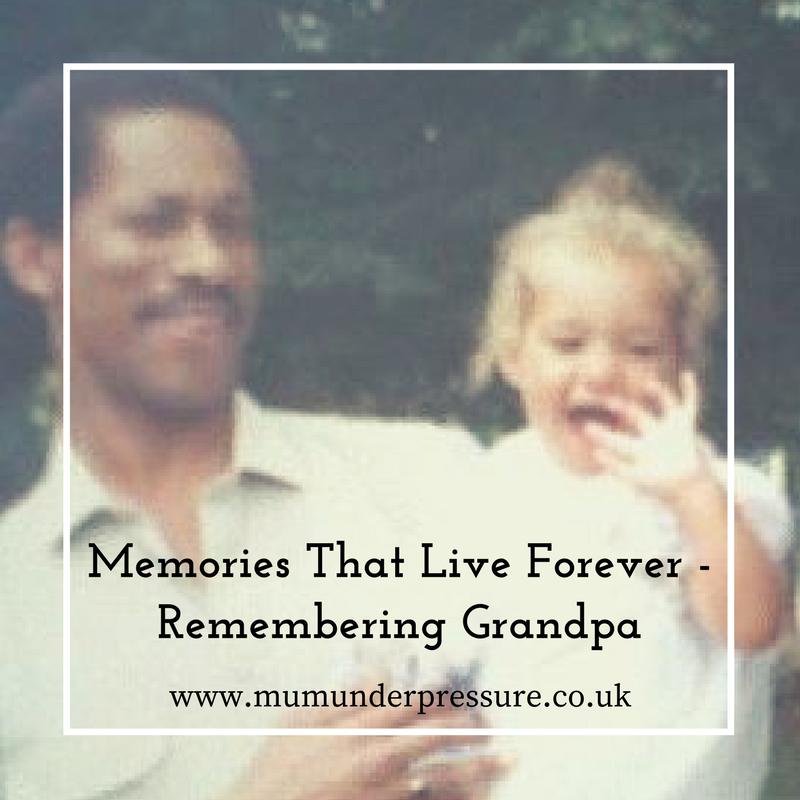 I really hope it lives on in their memories forever. Big Sister’s, my sisters are 12 and 4 years older than me. So they let onto the fact that Santa wasn’t real when I was still quite young and my friends were all still believers. History has kind of repeated itself in our household too. As the older girls 16 and 11 are non-believers so the 8-year-old is becoming well aware that he might not be real too! Family, forget the presents, I love spending time with the kids. Also, school holidays mean not running around like a headless chicken for the morning school runs. But when I have been to a couple of these people have always mentioned Blog On events. Which somehow I have always managed to miss, whether it was due to not being quick enough to get a ticket (they are like hot cakes) or not having childcare. When the date was announced for the Christmas one I jumped straight to it and booked, even though it is far too early to talk Christmas in September. As the months passed and the date quickly approached, I doubted myself about driving all the way to Manchester to have a day at a conference where I didn’t really know anyone. 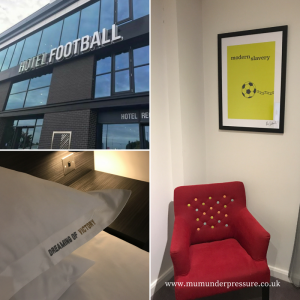 The childcare was in hand, Manchester is a fair old trek so arranged to stay in Hotel Football where the event was being held. Something crept up with work so I had to work on Saturday afternoon, so arrived late missing the Pre-Party, bummer a Southern Comfort or two would have calmed my nerves. I arrived really really late as I decided on a last-minute surprise visit to my big sister in Cheshire on the way. There were roadworks all around Old Trafford but I found the car park. But wasn’t sure of the route from the car park to the hotel. So called the reception to ask and the receptionist came out to meet me and show me the way. Once I checked and headed straight to my room. It was lush to chill for an hour or so what a treat. A complete night of unintterrupted sleep, bliss! The morning came with the usual worry of have I got the right outfit etc. I knew plenty of the bloggers attending were wearing Christmas jumpers. But as I have never owned one and live my life last minute, I didn’t get a chance to search the internet looking for one. Also, I thought I might not know anyone. I braved it and headed down about 10am and got a drink and sausage bap for brekkie. I spotted the friendly face of The Cheshire Wife so it was lovely to catch up. Then we headed for the welcome and the comical keynote set the conference off to a light-hearted start. The schedule of sessions was full of fellow bloggers that were very happy to share their expertise. Whether it be with newbies like me or established bloggers that wish to conquer their weaker area. One of the things I had heard about BlogOn was the large range of brands that were there to meet face to face on the day. Well, what can I say but wow, the lower floor of the Hotel Football was transferred into a Marketplace. 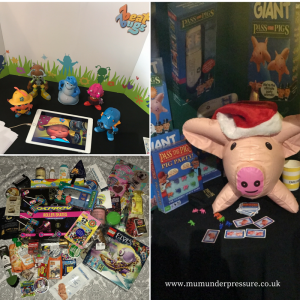 With representatives from many toy brands ready to chat to bloggers about potential Christmas collaborations. I braved it and spoke to plenty so hopefully, some work will flourish from that. There was also shoes and wine, win win! At lunch I got to chatting with a few new faces, it is always great to meet people and hear about their blog. 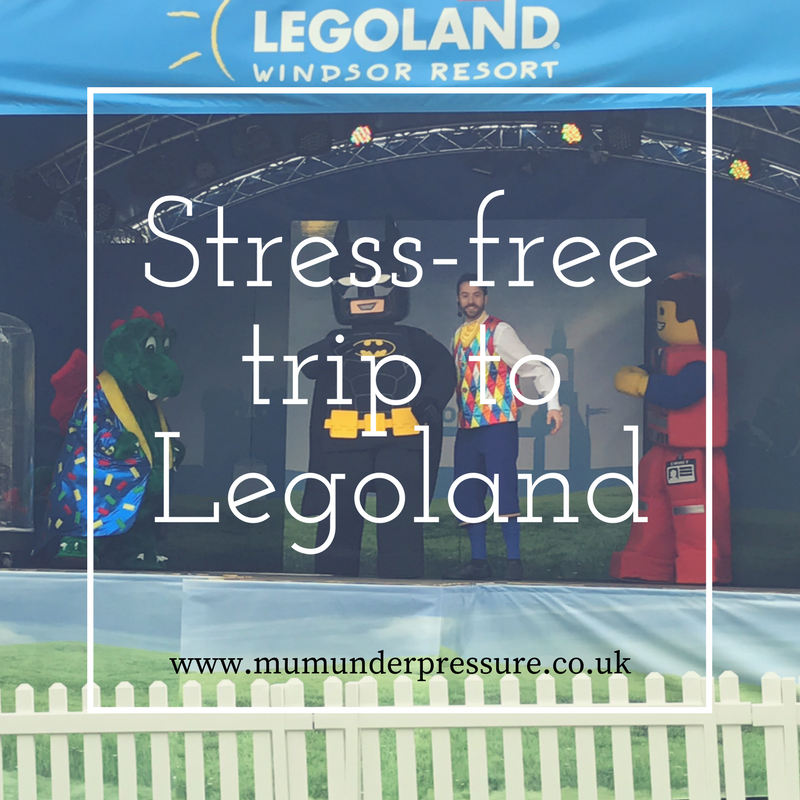 Laura from Tired Mummy of Two and the rest of the team were very helpful and welcoming. The day ended with the Toy Awards a first for BlogOn. There was a huge selection of toys to choose from, all delegates were asked to vote throughout the day. Then all of the toys were raffled off to raise funds for the BlogOn Community Fund. 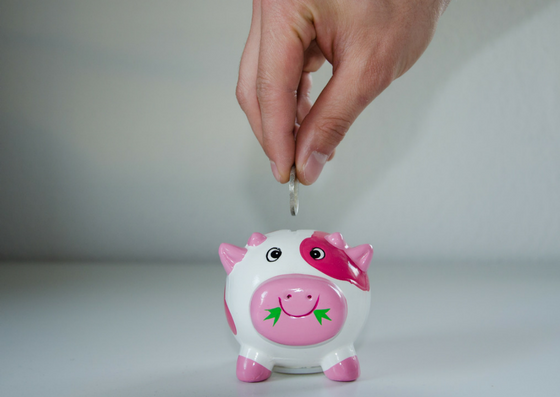 The community fund helps bloggers when unexpected things happen in life. Throughout the whole day, The Grinch was also milling around which made tied in well with the Christmas theme. The final part of the day was to collect our goody bags. 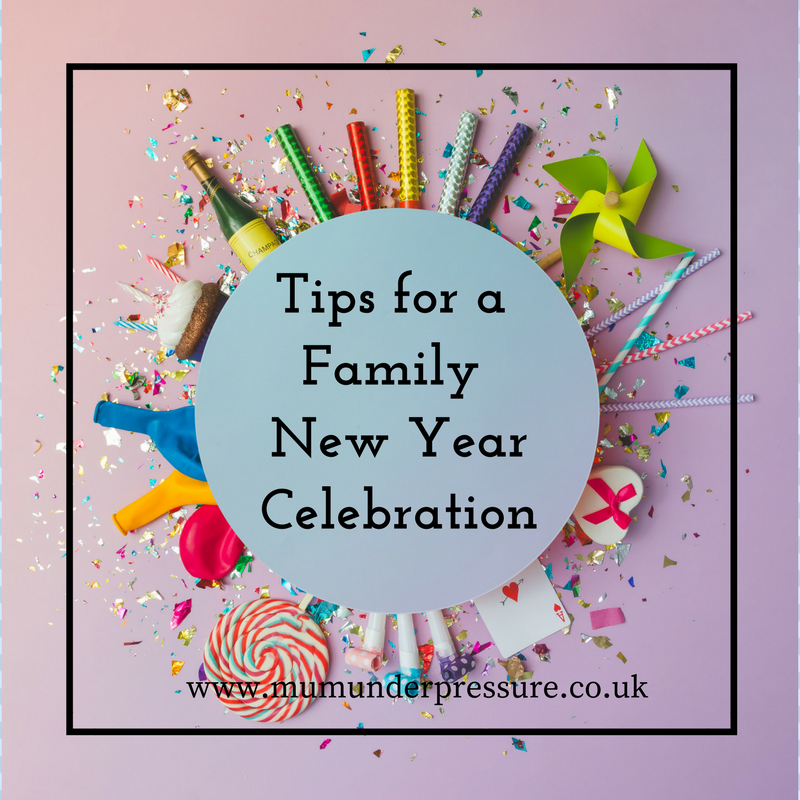 They were bursting with a huge variety of things from candles to top trumps, shampoo to Lego tape, children’s magazines to crisps, the list goes on and on. All in all I had a fantastic day. I have already pencilled the May date in my diary as I will definitely be returning to BlogOn in the Spring. Even though we live about an hour and a half from Weymouth we love a day at the seaside. 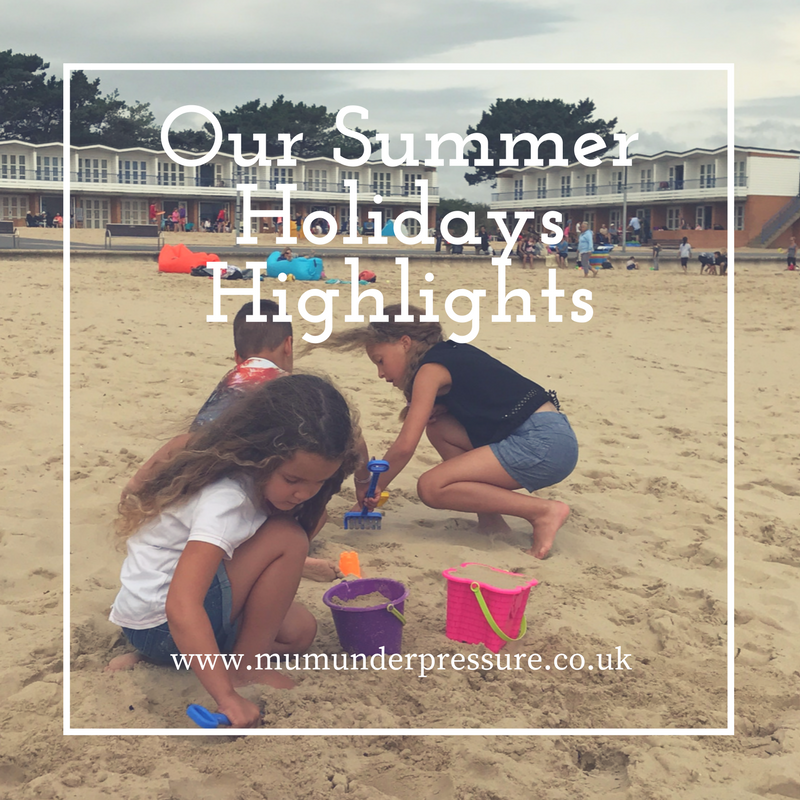 We often head to Weymouth as there are lots of other activities to do as well as just the beach. 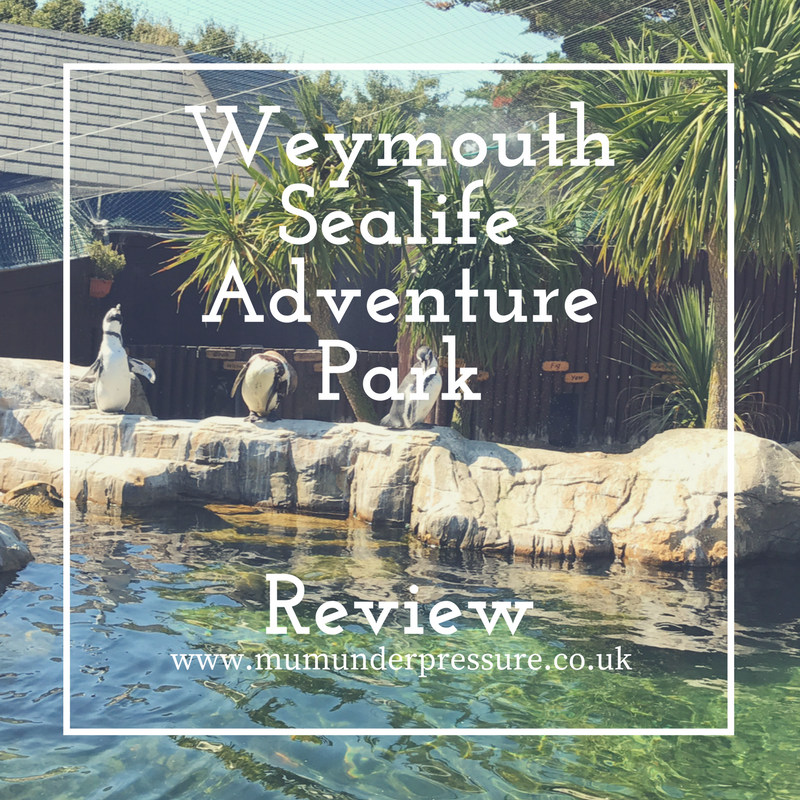 One of the must visit places in the town is definitely Weymouth Sealife Adventure Park. 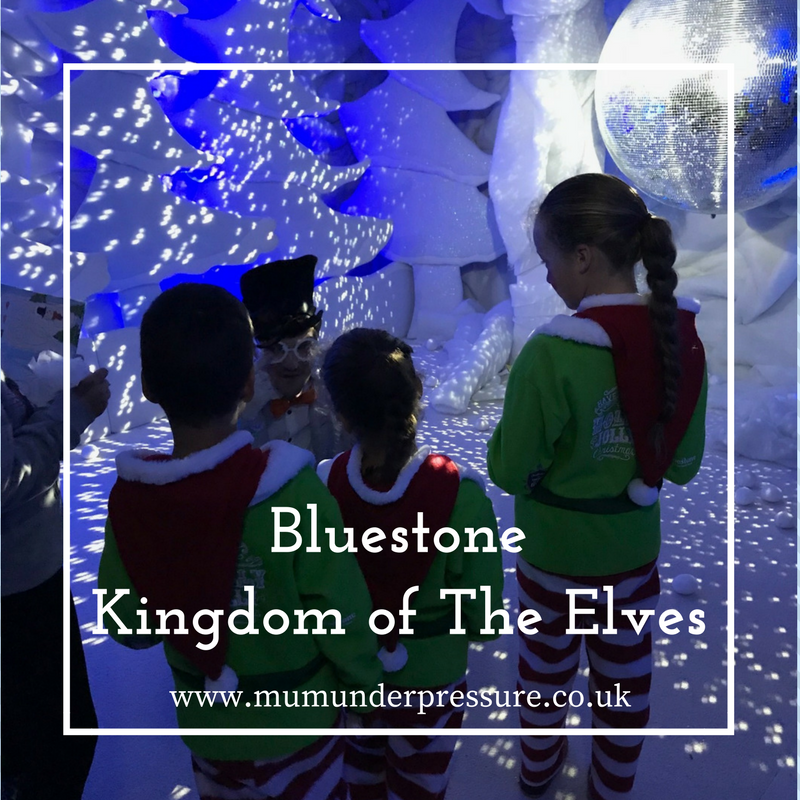 Last week our family visited Weymouth Sealife Adventure Park, we have visited before and it has to be our favourite Sealife Centre. It has lots of other attractions as well as the aquariums. The outdoor space is fab to sit down and relax too. 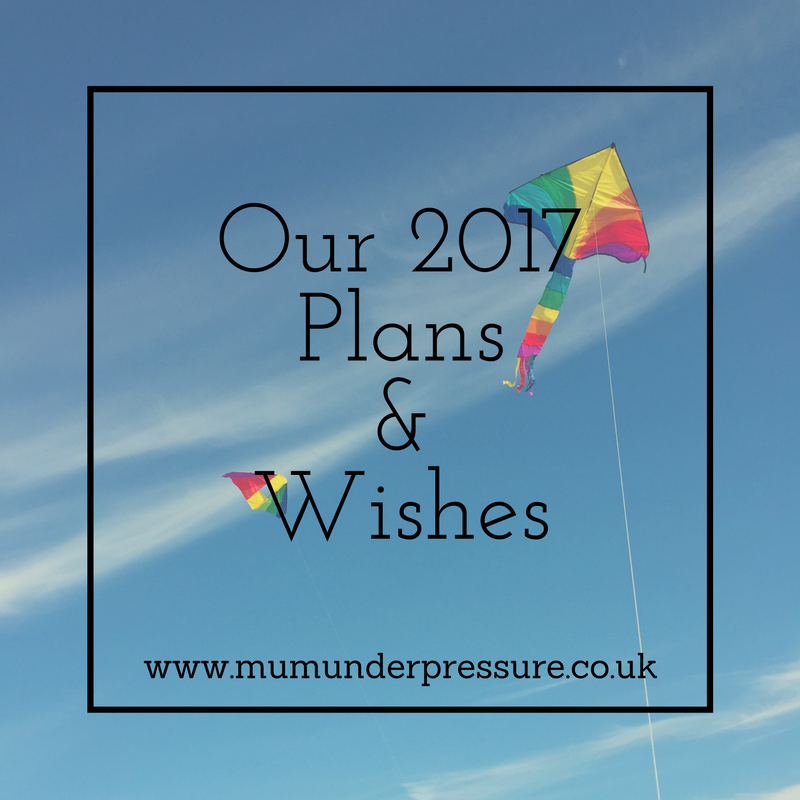 I thought that I would share with you what was new for 2017 and our favourite bits too. 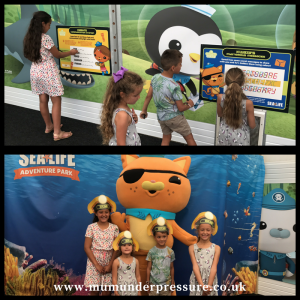 During this month they have an Octonauts attraction to become an Octoglow Explorer, so definitely worth a visit, if you have an Octonauts fan in your family. The kids get a little time to play and solve the Octoglow tasks, then they got to meet Kwazii Kitten. My favourite new addition was the Turtle Rescue attraction. It is an interactive task for the kids to rescue, weigh, feed, hydrate and get their turtle. 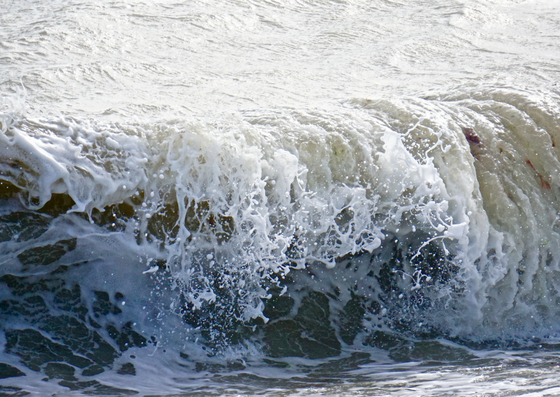 Once it is back to good health they can release back into the sea. The kids talked about Turtle Rescue all the way home, so was definitely a hit with them. Also this year they have opened the pretty fantastic Caribbean Cove Playground. It is bright spacious and very child-friendly. 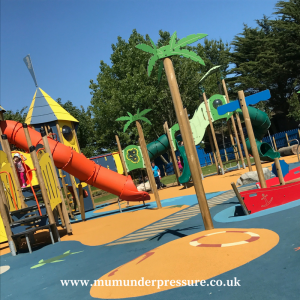 There are parts for children of all ages from the sandpit to the climbing up the tall towers and sliding down the wriggly green slide. The area has a coffee shop, so parents can grab a cuppa while they relax and watch their children play. 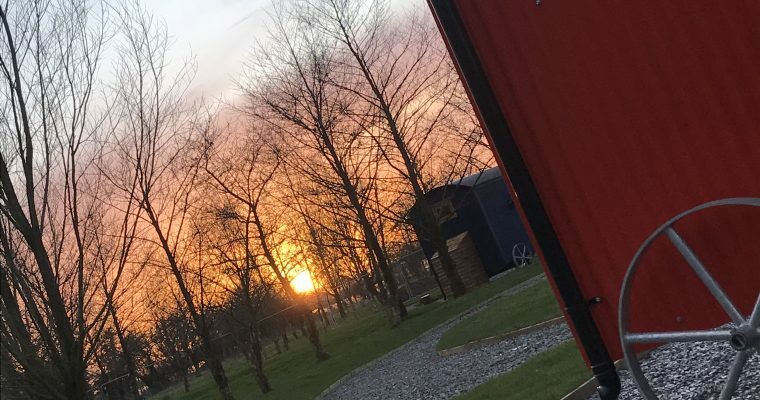 There are also toilets in the area, so you really can spend a large proportion of your day in this area if the weather is fine. Every time I mention to the kids that we are going to Weymouth Sealife Park, the first thing they say is I hope it’s sunny so we can go in the Splash Zone. And luckily on this visit, it was very sunny after all the summer rain we have had. So they got to get soaking wet and have loads of fun in the water. There is also the larger pool too but the littlest member of our family wasn’t that keen on getting in there, so the others stayed in the splash area to play with her. On this visit, we caught the Seal’s talks and feeding time, heard about the otters during the talk. Plus we spent awhile observing the Penguins and comparing birthdays and names. Walking through the ocean tunnel and spotting the turtles and sharks is always great fun too. Once we had spent a good 6 hours in the Sealife Park we headed just across the road for a paddle, before we picked up so dinner and headed home. 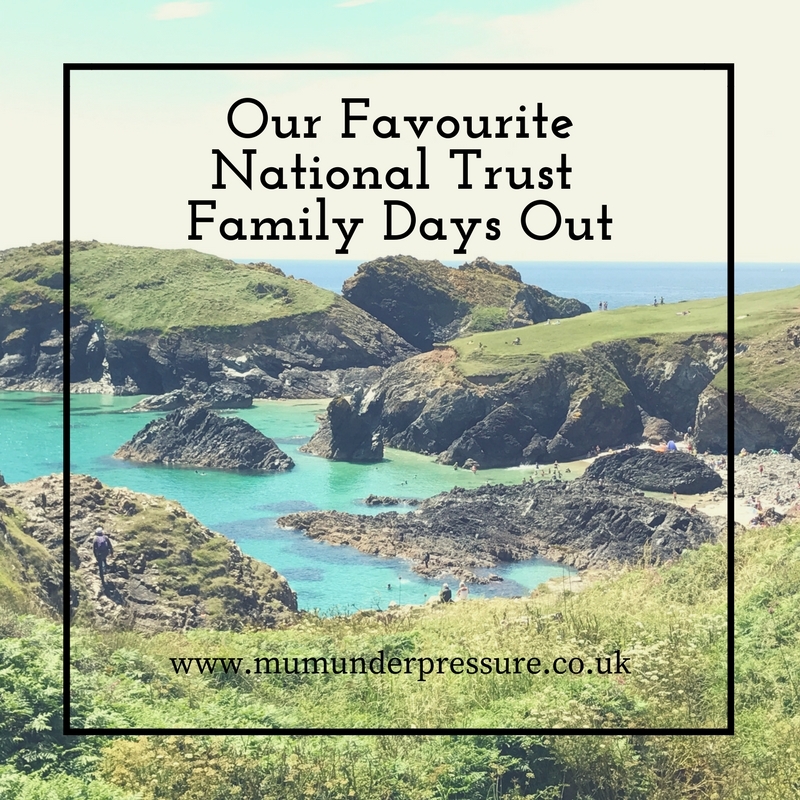 A great family day out, with some lovely memories made. Very much worth the trek. 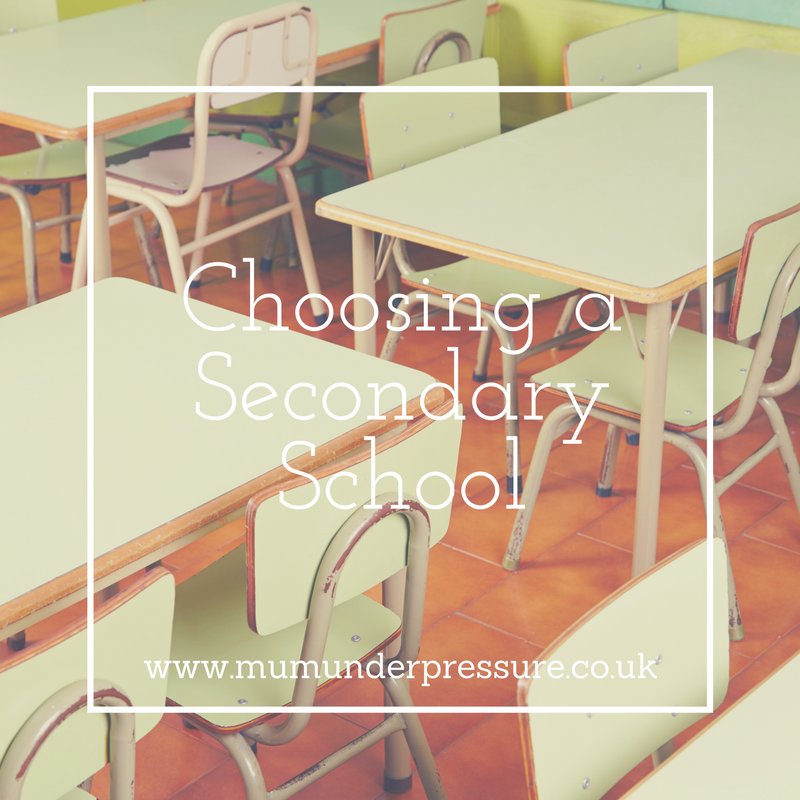 This September my youngest of my 5 children starts Big School. 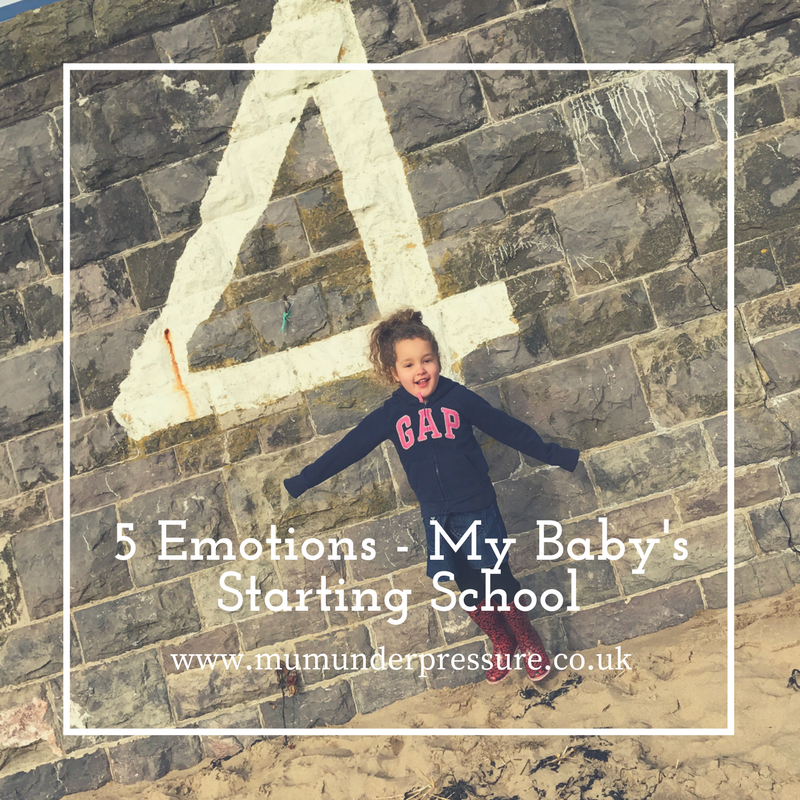 So I thought I would share the 5 emotions I have been feeling lately about her starting in reception. When she was born, I remember saying that 2017 would be a big year. 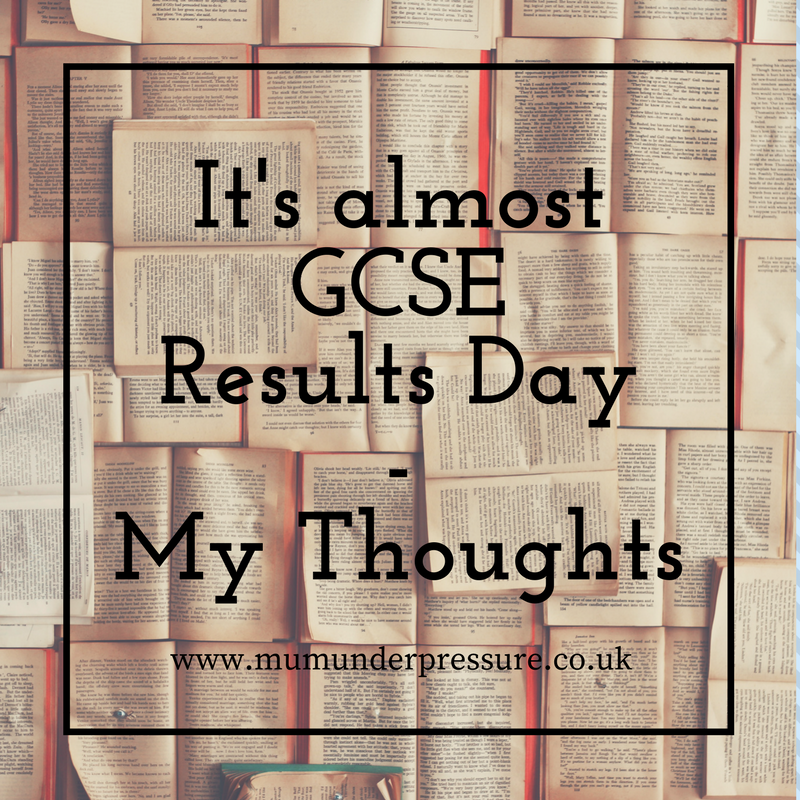 My eldest has just taken her GCSEs, awaiting results and will be off to college. My second daughter is off to secondary school and then A starts primary school to join her 2 siblings. So even though it is the start of something new for her it is the end of a long stage (16 years) of having at least one pre-schooler. I have felt every single emotion possible recently. 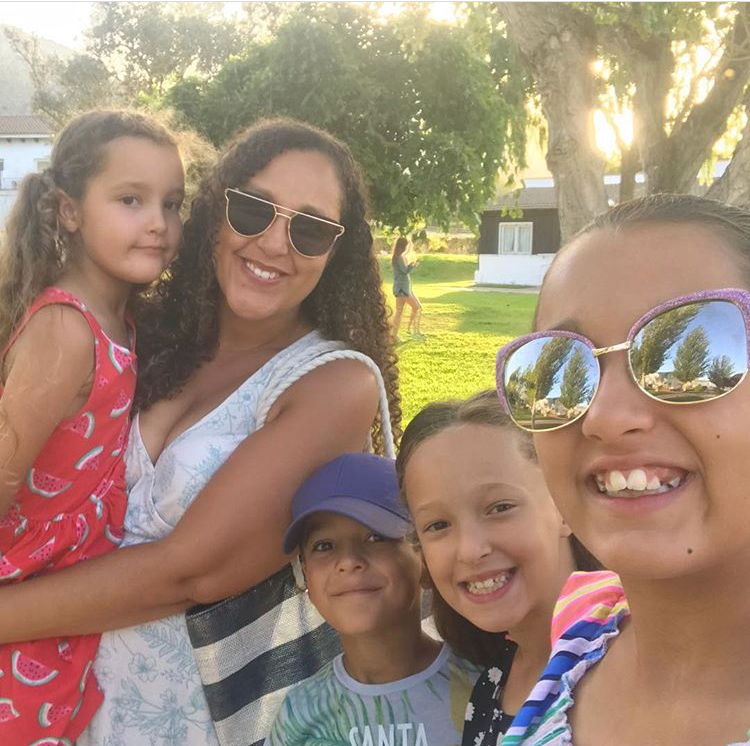 Sadness – Having 5 children it would be very obvious for anyone to guess that I love babies so much. The warm and fuzzy feeling when you bring a brand new baby home from hospital can’t be beaten. 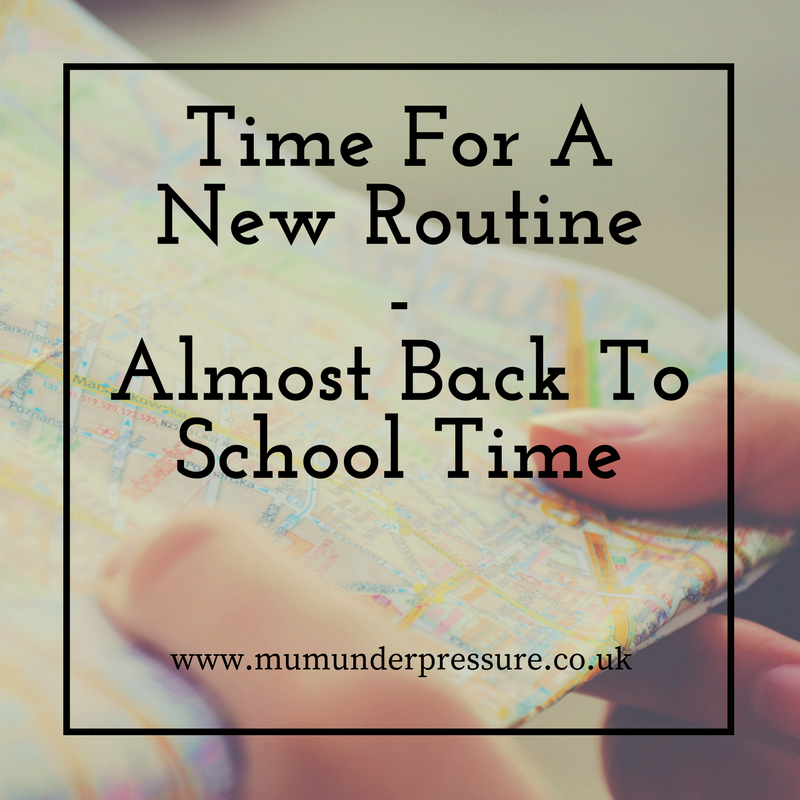 Knowing that a newborn is totally dependent on you for feeds, nappy changes and being rocked to sleep. When I decided to have A it was to bring light after the sadness of my Daddy’s (the kids Grandpa’s) death. But as time went on the sadness of him never meeting her was tough and days like her first day of school that he isn’t there for are difficult too. She has grown so fast and the last 4 years have seemed to go quicker than with her older siblings, so I get sad that I have blinked and missed it. Now she will be finding her own path without me to oversee what’s going on. 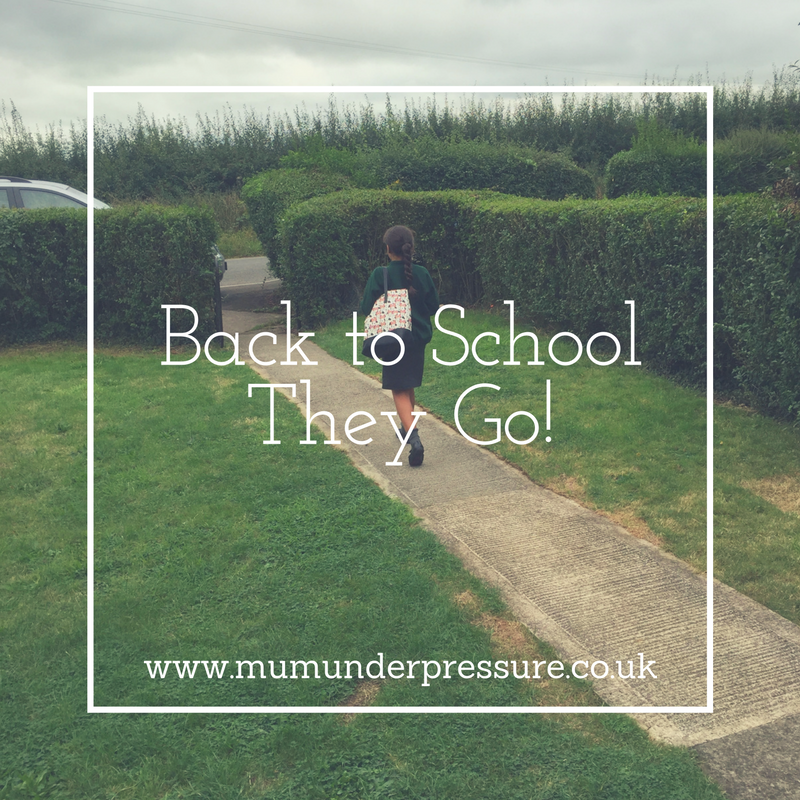 Excitement – Once all my kids have started school they have changed from the word go, so I am very excited to see her flourish. And find her feet on her own at school, see the new friendships she builds. Regret – I didn’t spend enough time with her in the last 4 years. Having been the only one financially providing for the kids for the last 5 years, I have had no other option than to work. 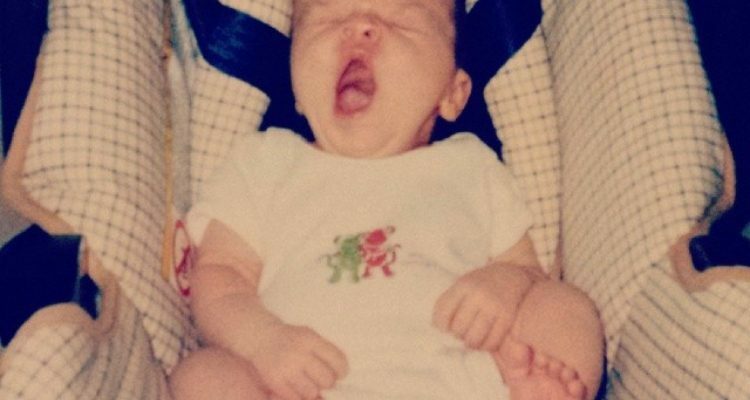 I had a little bit of cover for the first few months of A’s life. 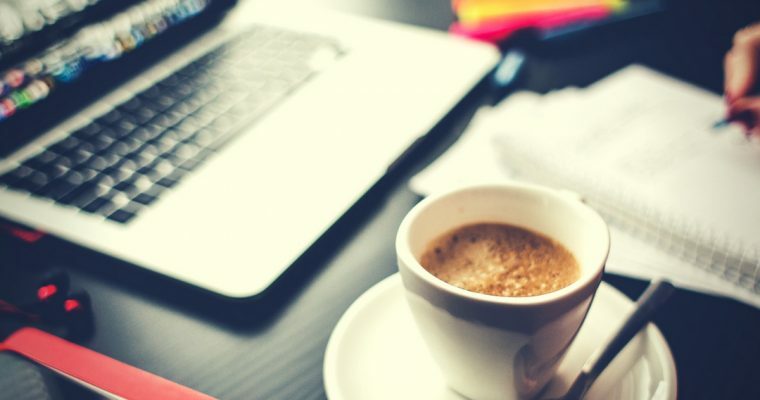 But being my own boss running my business, I was never able to turn off to what’s going on. So I have been guilty of feeding her whilst replying to emails. Plonking her in front of cbeebies whilst I market my next event. Not noting down when she got to milestones, as I was so busy dividing myself in 5 or 7 if you include the house and work!!! Proud – I am so proud that A is ready for school and become a confident little girl. I have solo parented the kids for the majority of A’s little life so a little pat on the back that I have managed this far. Happiness – As I am ready for a new chapter in my book too. 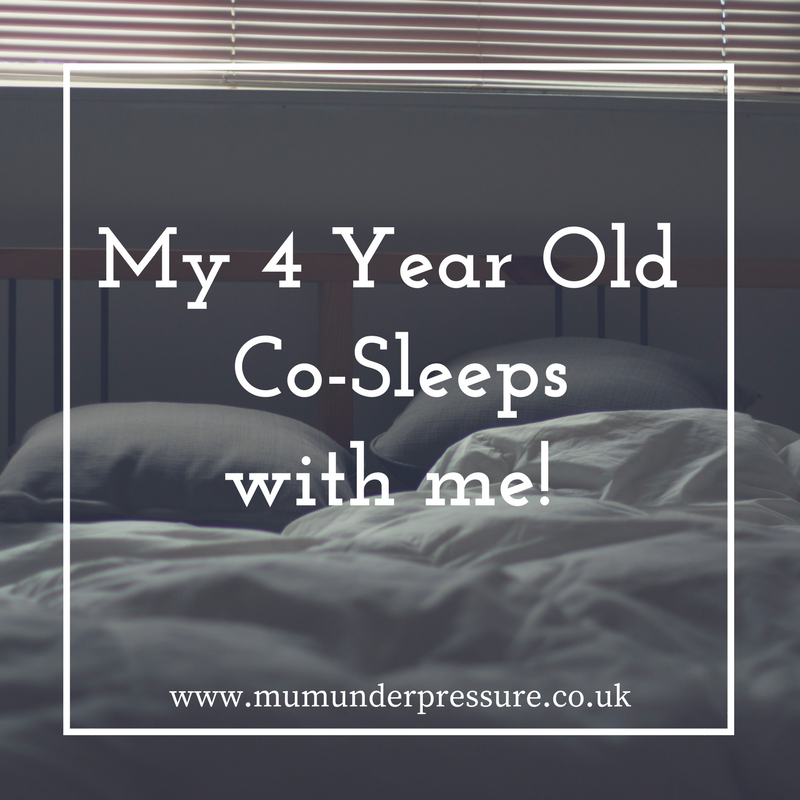 I have been running my business around having a pre-schoolers at home for the last 7 years. So I will hopefully have more time to devote to building my business. As kids only get more expensive as they get older, so I need to fund them. Plus as selfish as it seems I am looking forward to having some time to myself. You might even find me at the gym, well when I have finished that chocolate bar!!! Phew now that is off my chest, I feel kind of ready, but know that there will be some tears. Pop over to my Instagram account and prepare yourself for 1st Day at School Spam. So when I was ten I probably couldn’t even use a computer, now my 10 year old is a whizz online. The internet is a great resource but also a pretty dangerous place, so the request of a mobile phone is a pretty big deal. I have granted her request and she now has a smart phone which is going to be essential for me to get hold of her when she heads to secondary school in September. But as I handed over her new phone to her I also got her to sign a pre-teen mobile phone agreement, which gave her pointers on how to use the phone safely. I have chatted with her about what is wrongs and rights of how to use the internet. Also her teachers at school, have recently covered how to stay safe online during Safer Internet Day earlier this month. So hopefully she will use it in the right ways and a calls when she goes awol when she’s a little older!!!! 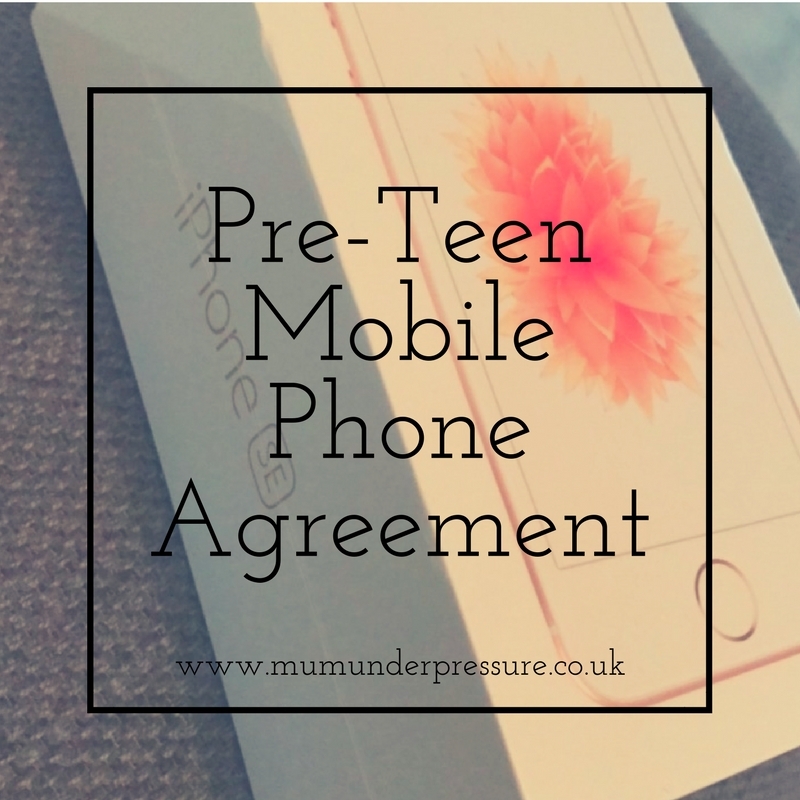 Pre-Teen Mobile Phone Agreement between Parent and Child. I understand that my mobile phone may be taken away if I behave badly, fail to do my chores. I will obey rules of etiquette regarding mobile phones in public places. I will make sure my phone is turned off when requested. Once every 4 years, the world seems to come together to put on a great show of solidarity for just 2 weeks. So it got me thinking about what the Rio Olympics were teaching the kids. We aren’t a hugely sporty family, we don’t take any notice of the football league tables. But when the Olympics are on we catch up with as many events as possible. 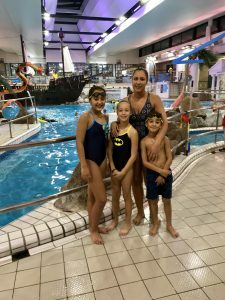 From Gymnastics to Swimming and Athletics to Diving (yes that sure is Mummy’s favourite!) there’s always something good to watch. 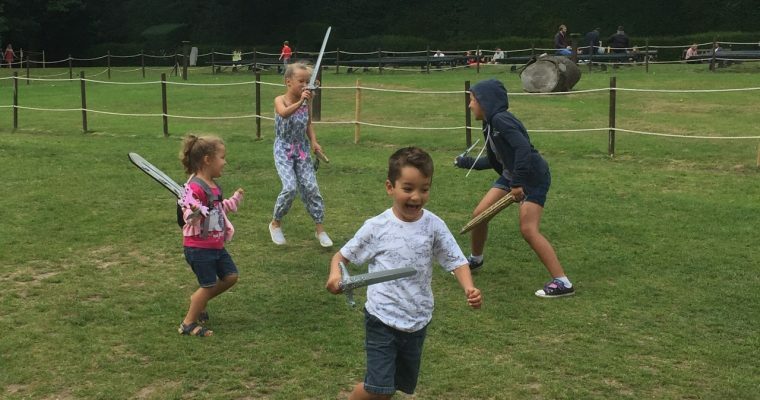 When watching the kids get right into it shouting and cheering at the TV, their passion towards the varied games got me thinking, yes my brain is still just about functioning after entertaining little people for the last 4 weeks. 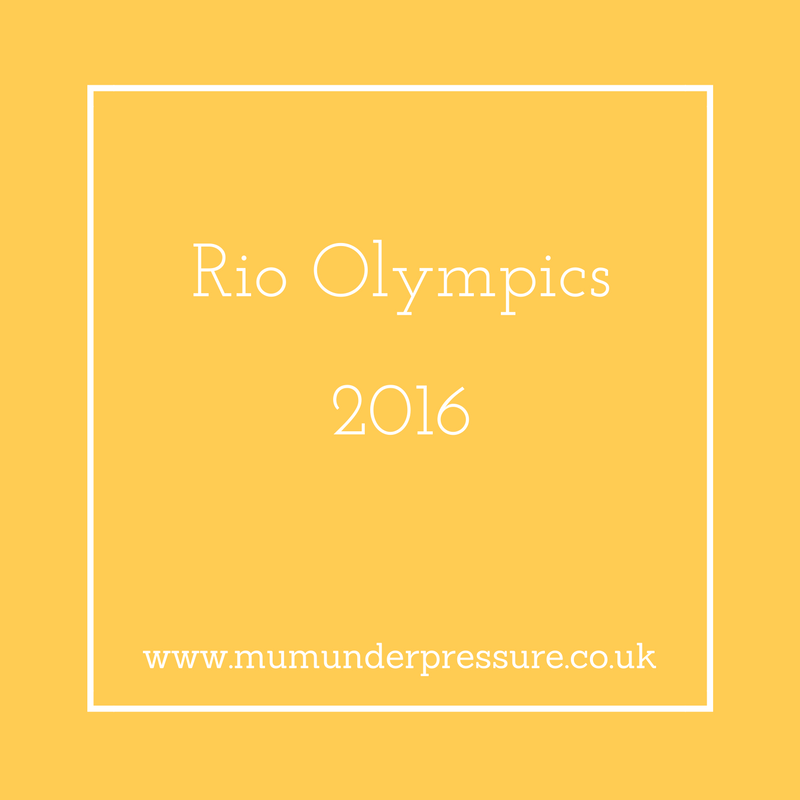 And I wanted to share the 5 things that the Rio Olympics have taught the kids. Never Give Up – Watching those olympians that have waited for years to get the results they want, taught the kids that some things take longer than others and there is no instant success. It’s ok to show emotion – When an athlete gives their sport their all and and they get the result they want or they don’t you see tears of joy and woe. Some things don’t always go your way – Two words Tom Daley, we loved the Diving and Tom Daley looked certain for a medal after diving amazingly in the first round of the his diving category and then came the semi’s and he literally belly flopped it, so after years of training, the pressure got to him and he didn’t even qualify for the final. 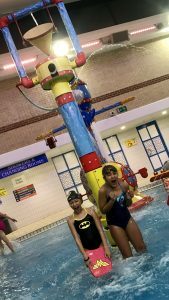 A sport for everyone – The kids said to me that they didn’t realise that there were so many sports, how true is this so whether you are a team player or like to do your own thing, there’s something to interest everyone. 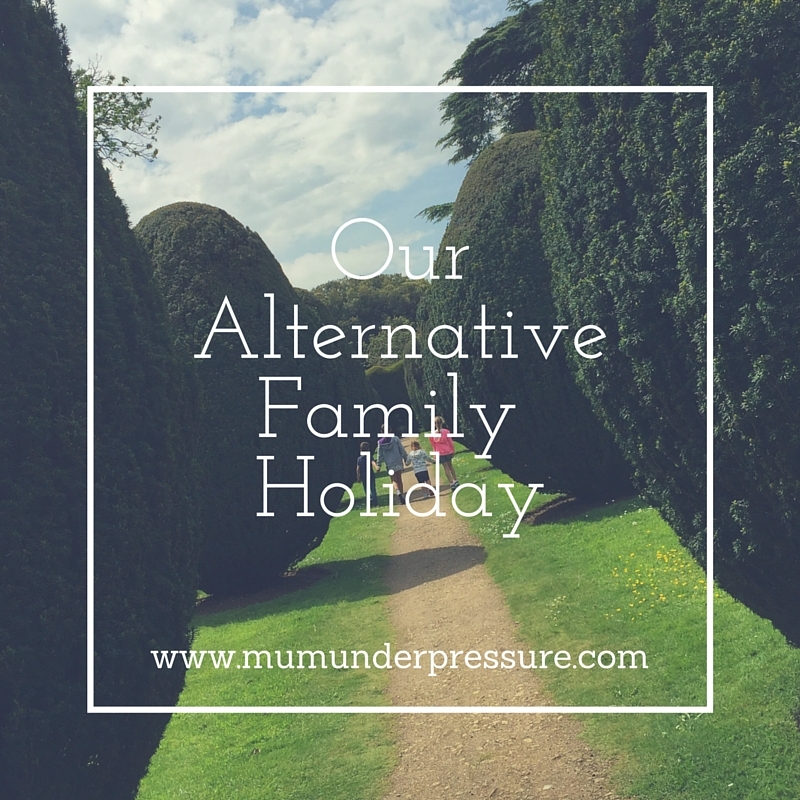 One Mum, One Business, One Home, One Car aka Bus, 5 Children, 2 Cats and anything else our busy lives through at us. Me a Mum who never wanted to follow the rules, well I was the baby of the family afterall. 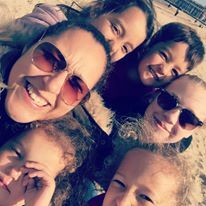 So 33 years on I am a single Mum to 5 children and if I wasn’t busy enough I run my very own business too. The Firstborn is now a teen and knows her own mind. She has fundamental made me the mother I am today. Growing and learning with her everyday. The Smiley One is all ways there to check up the room, she easily makes friends and always sees the good in everyone. The Brainy One can often be found reading a book quietly whilst chaos erupts around her, whilst she is busy trying to decide weather she will be an author or scientist when she grows up. 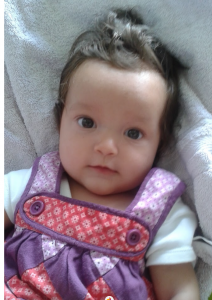 The Baby the cute/naughty one that has the rest of the family wrapped around her little fingers. Our Home is lived in, well seriously I would much rather be spending time with my tribe rather than spending all my time off cleaning. One day soon I will employ a cleaner but need to tidy up first!!!! So having a larger family I have no choice but to drive a huge 7 seater car aka The Bus, no sports car her. 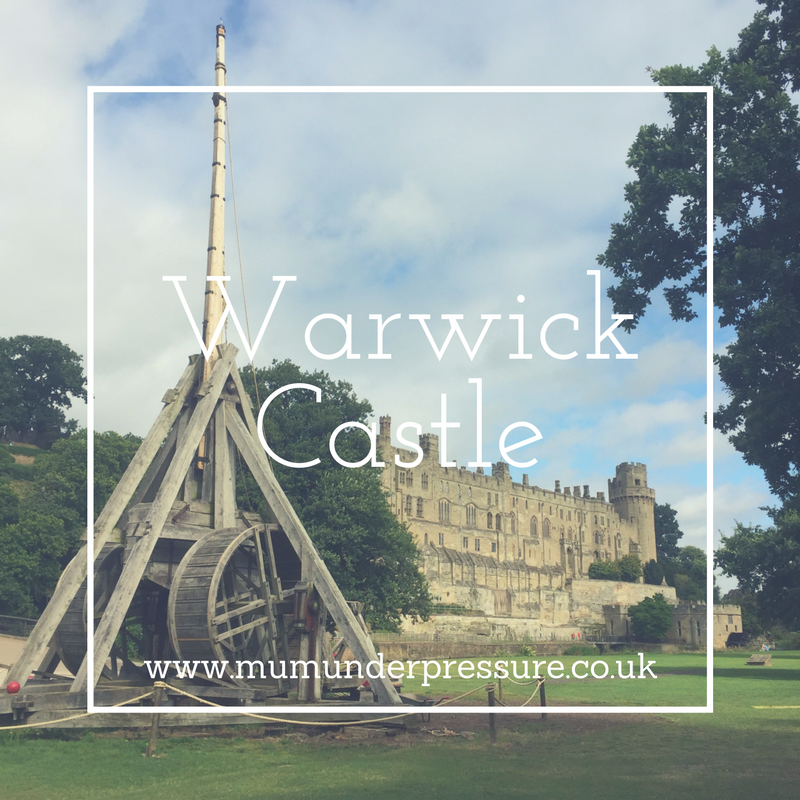 That’s a little bit about us, please hit like our Facebook page to keep up with our fun, stress, adventures, celebrations and the odd tear too.